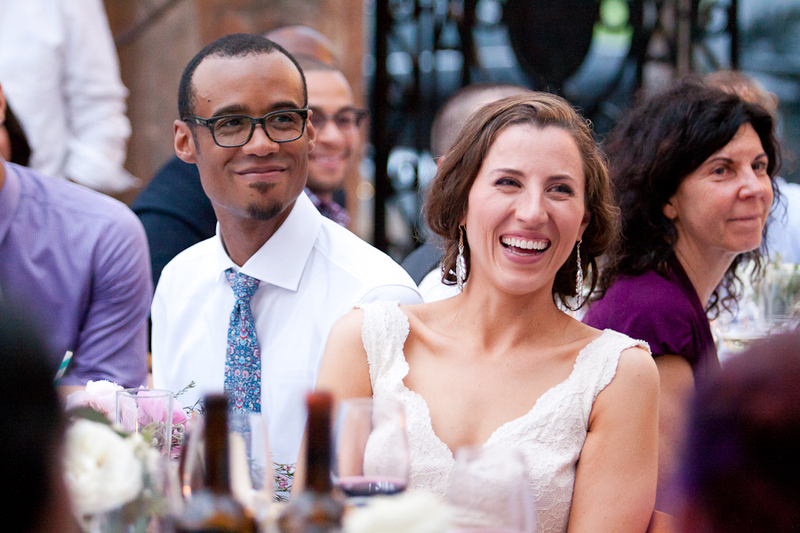 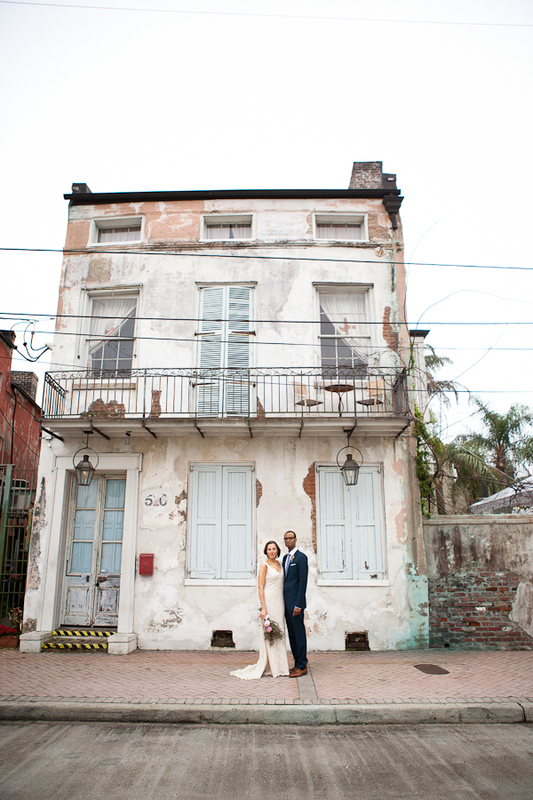 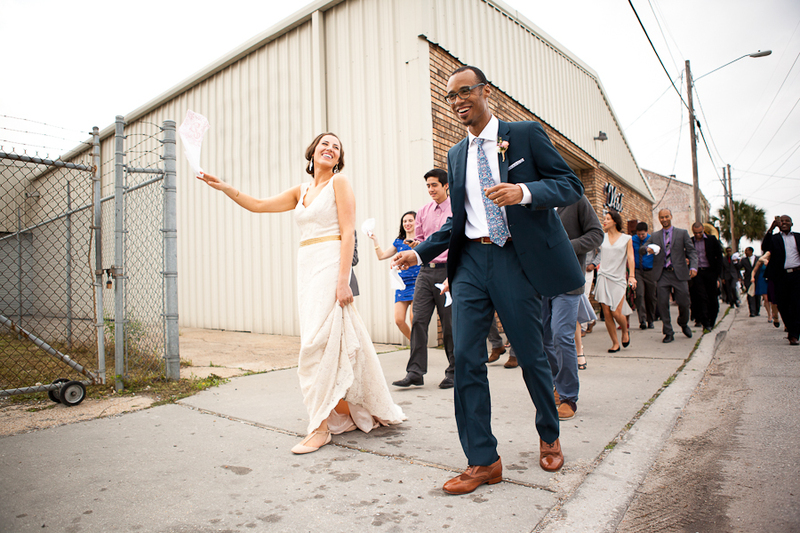 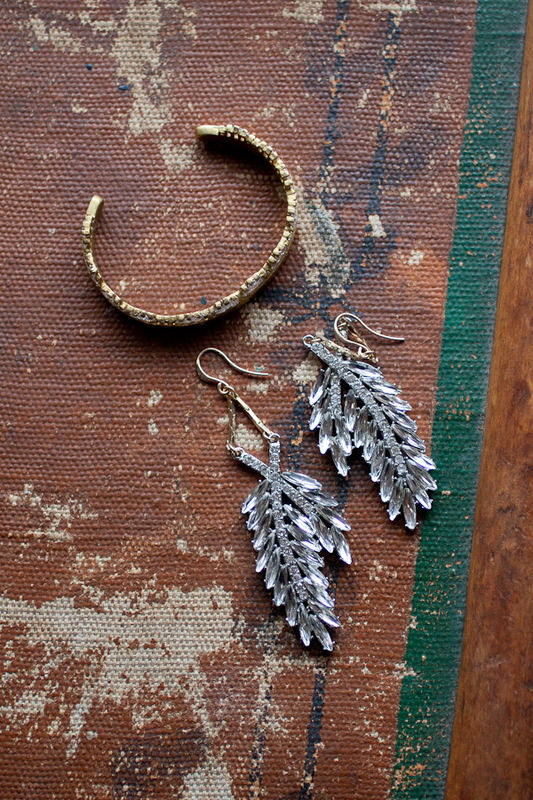 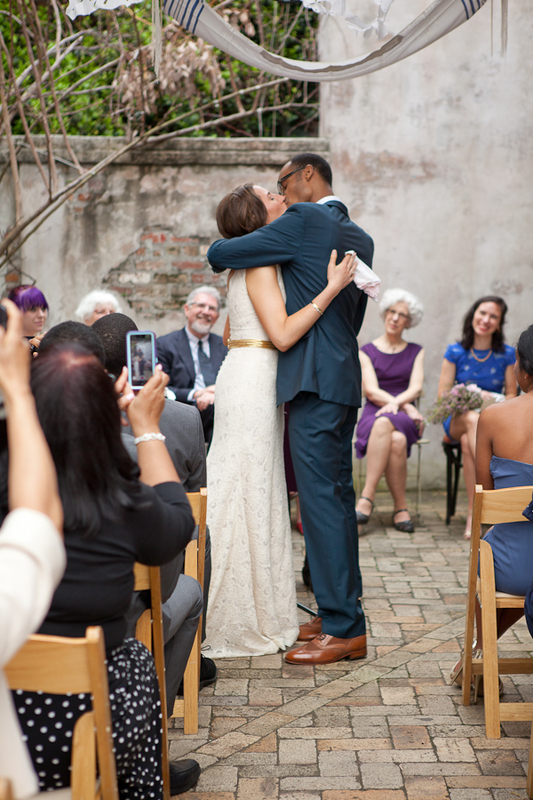 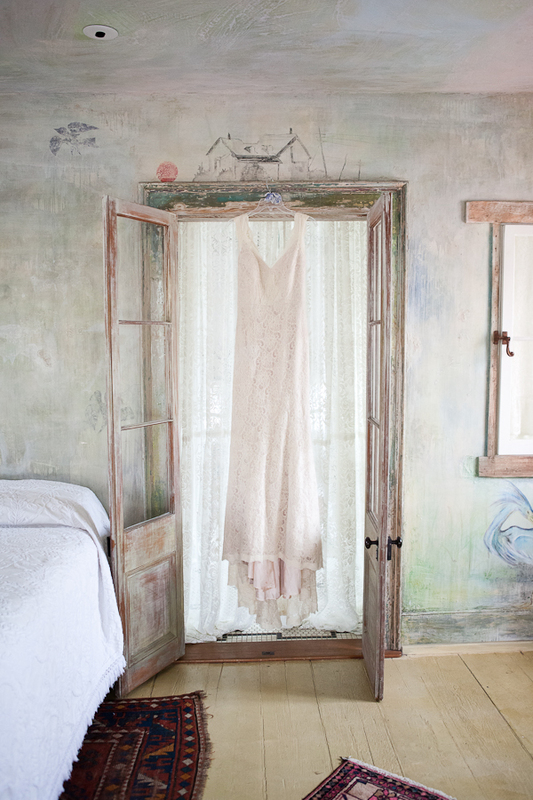 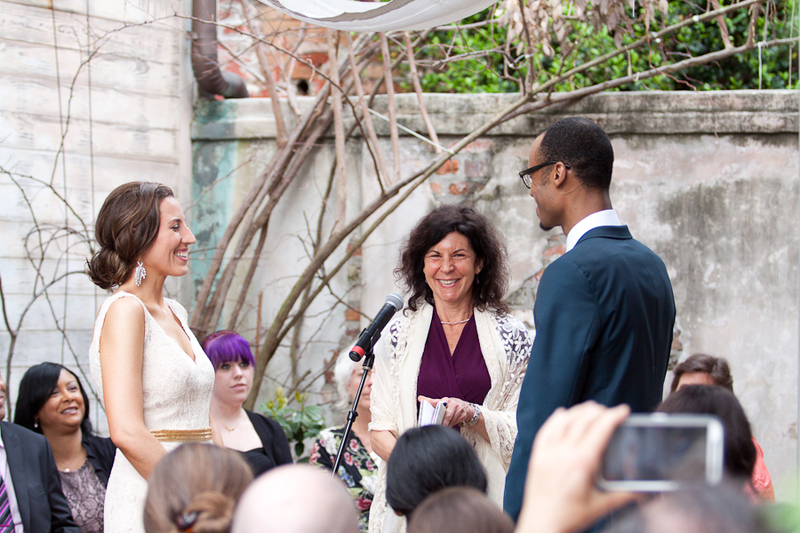 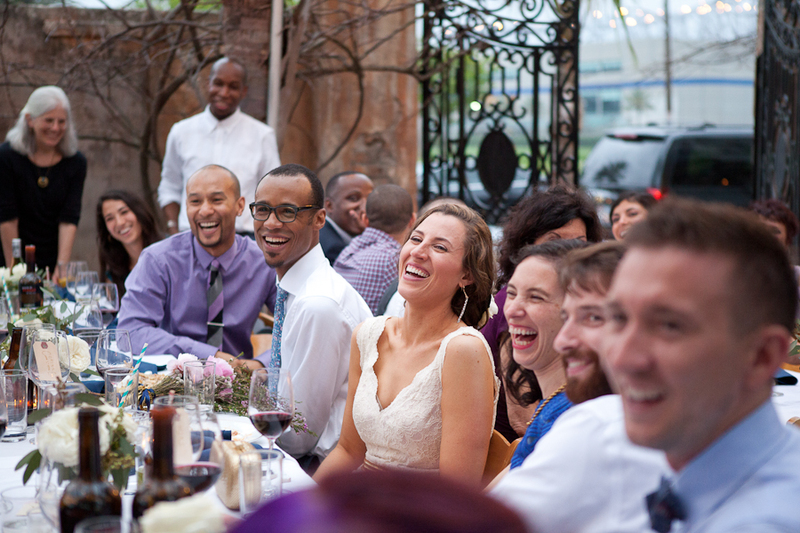 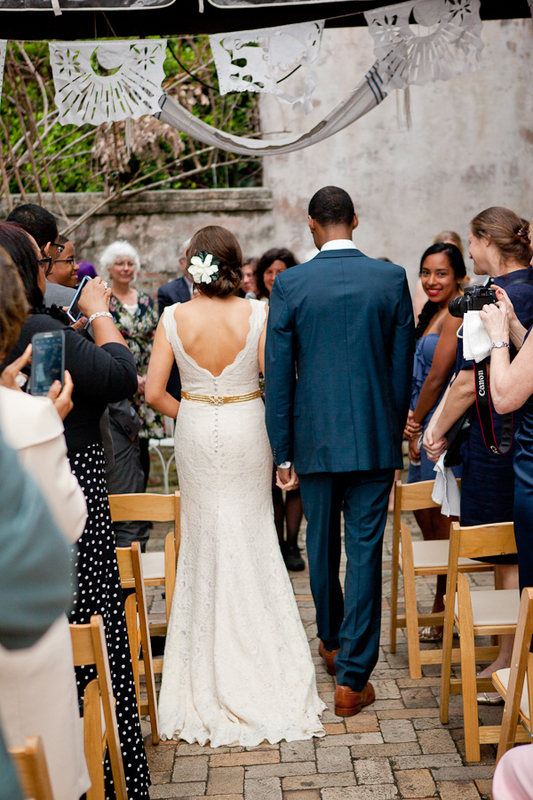 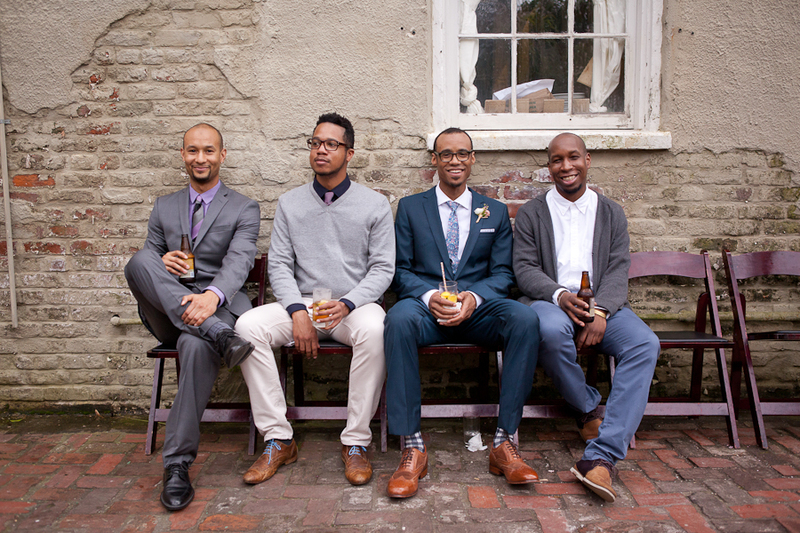 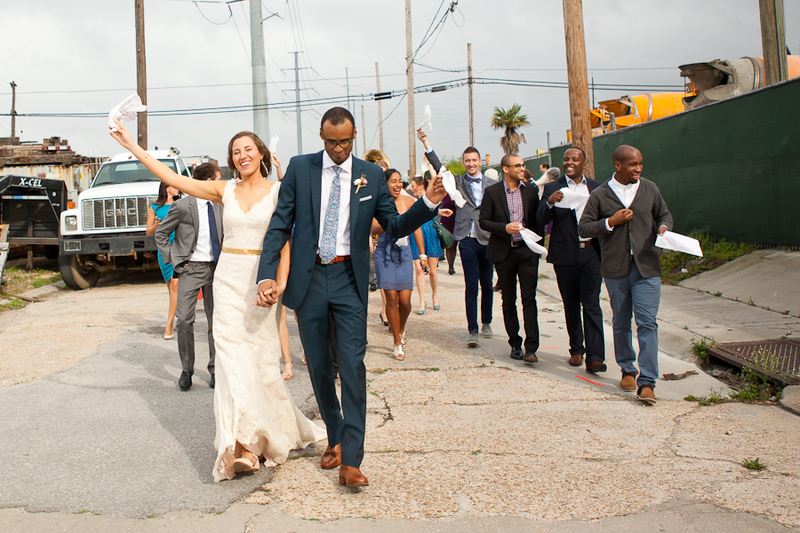 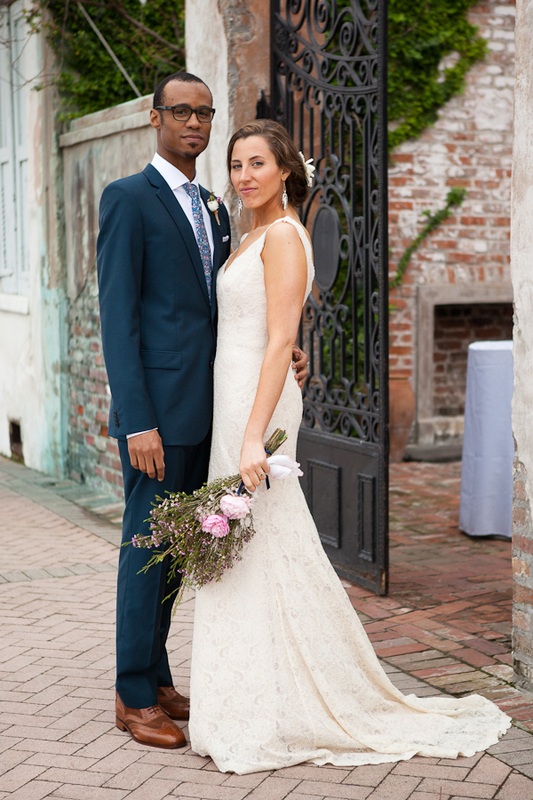 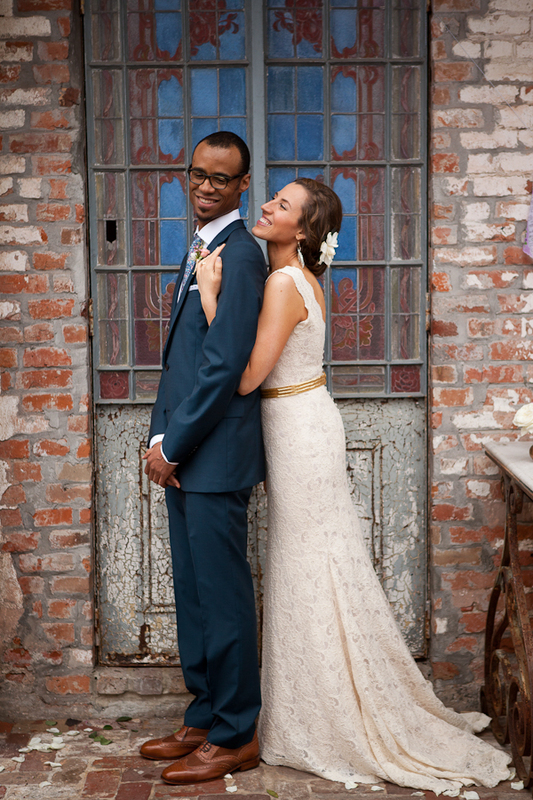 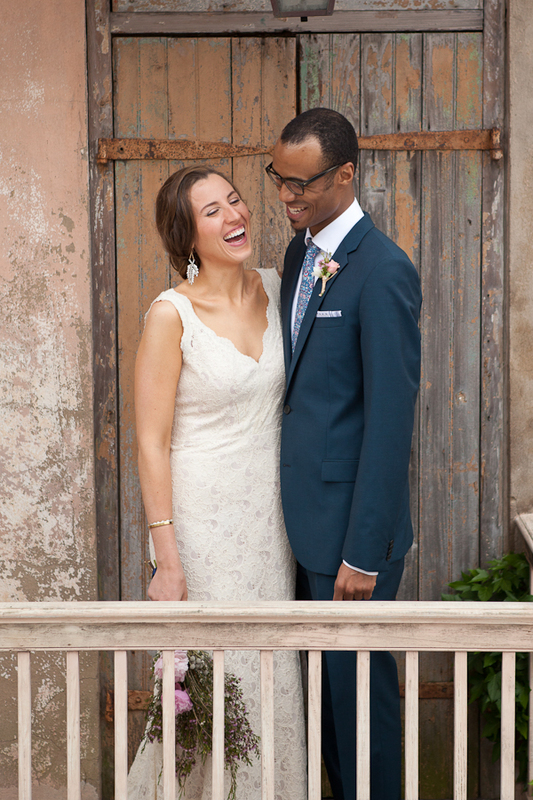 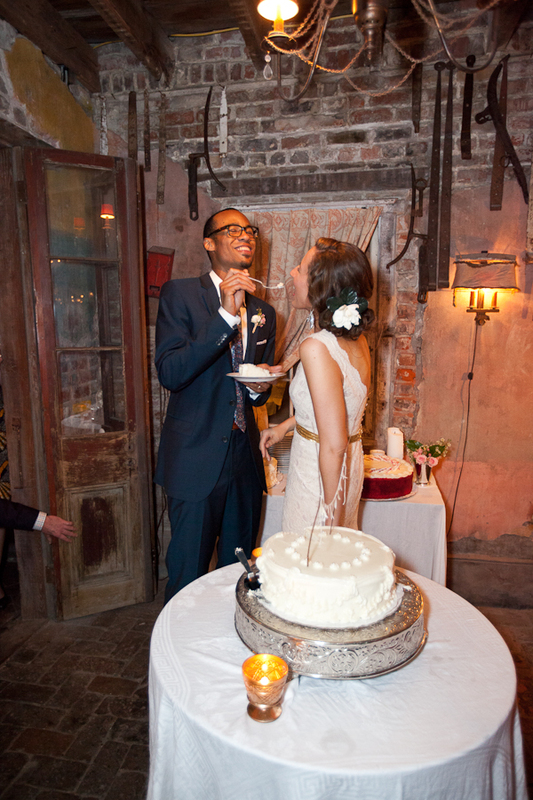 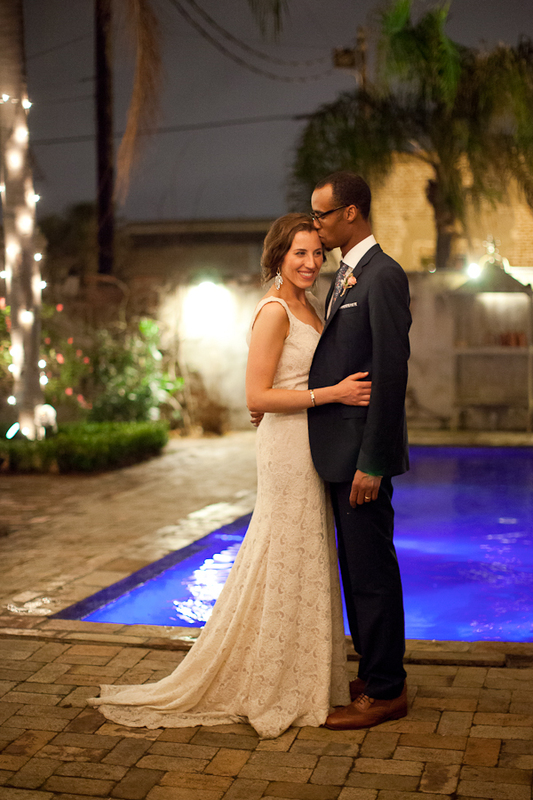 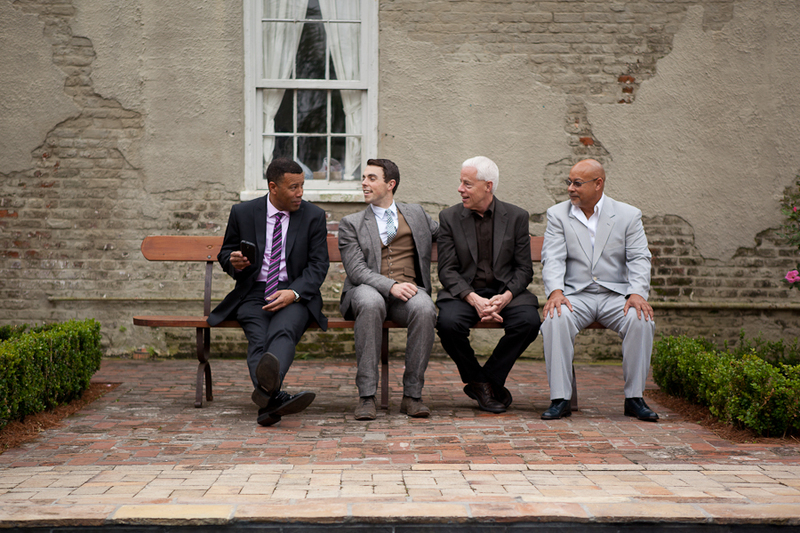 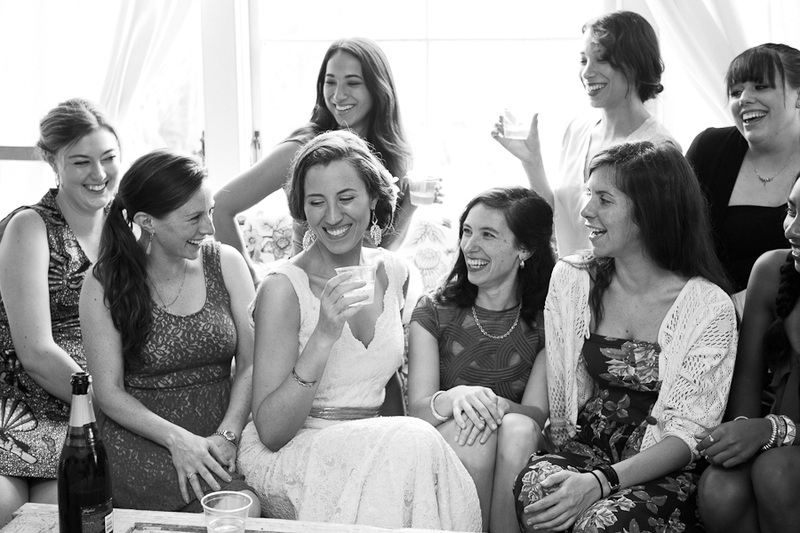 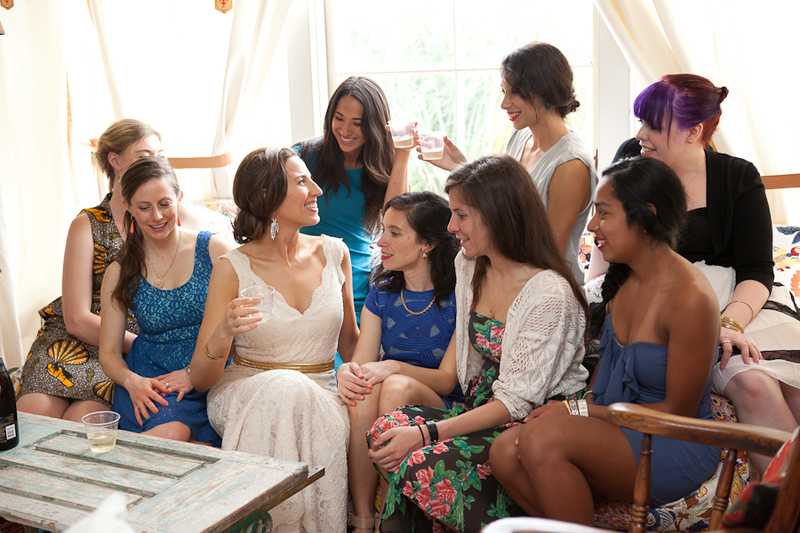 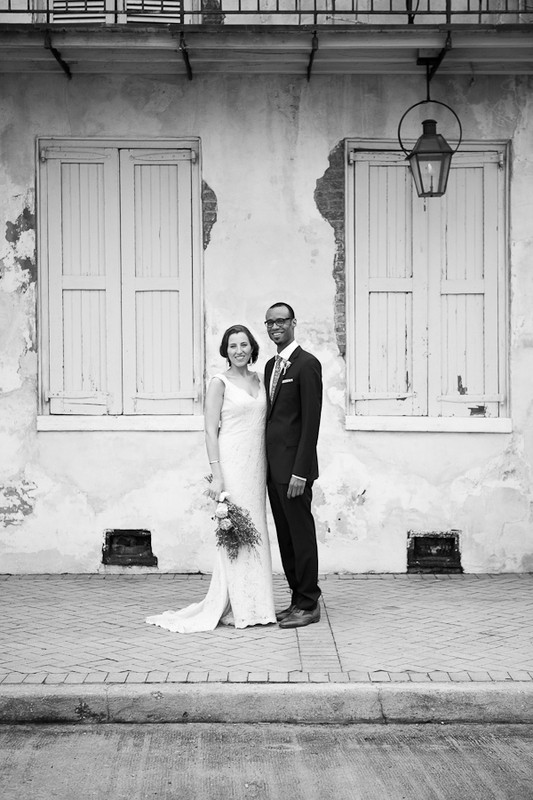 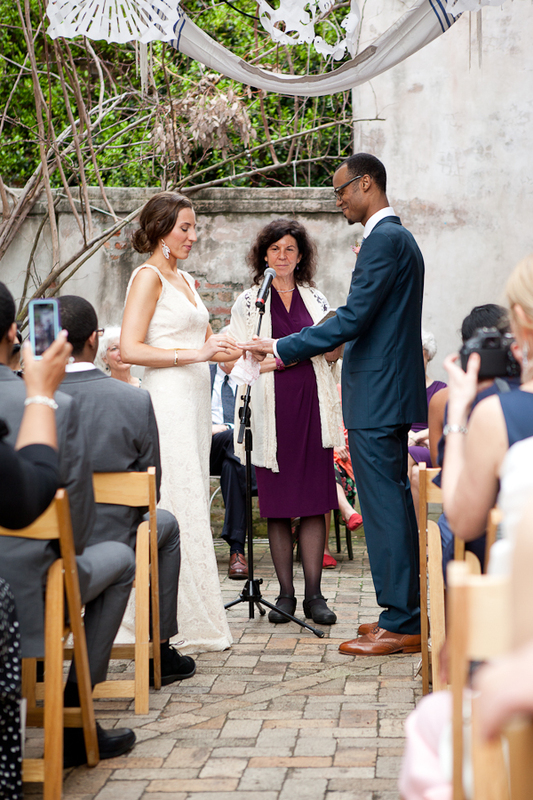 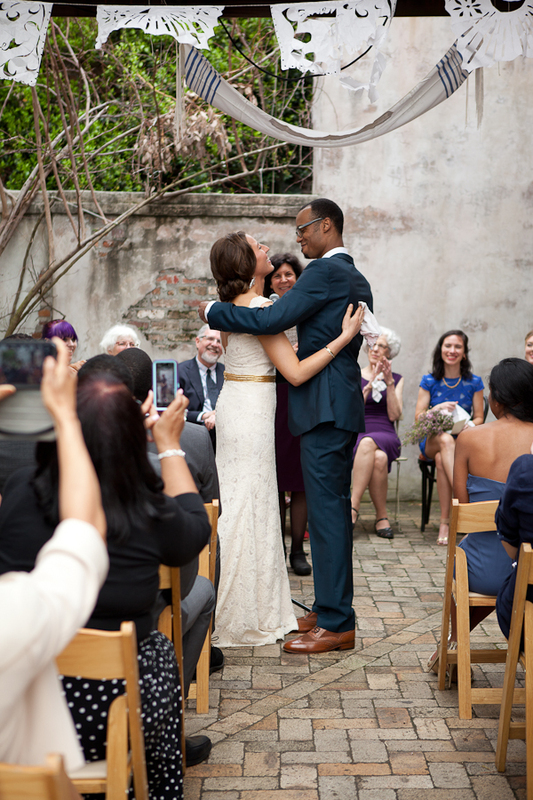 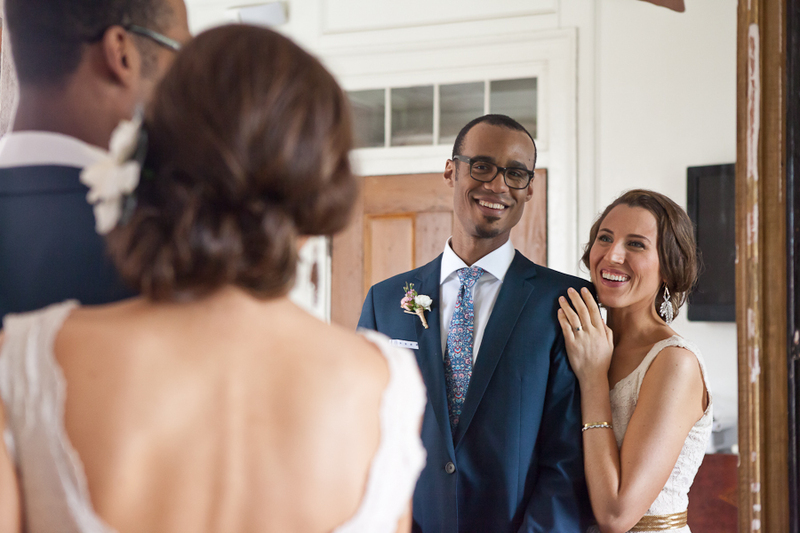 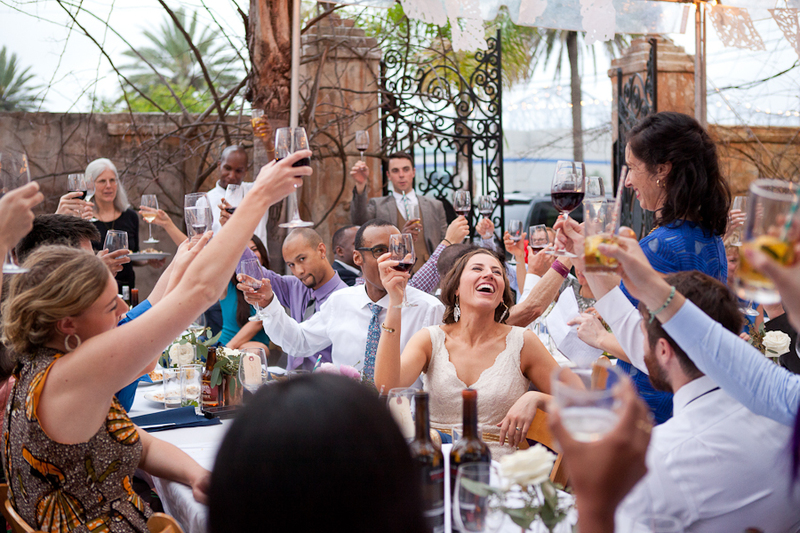 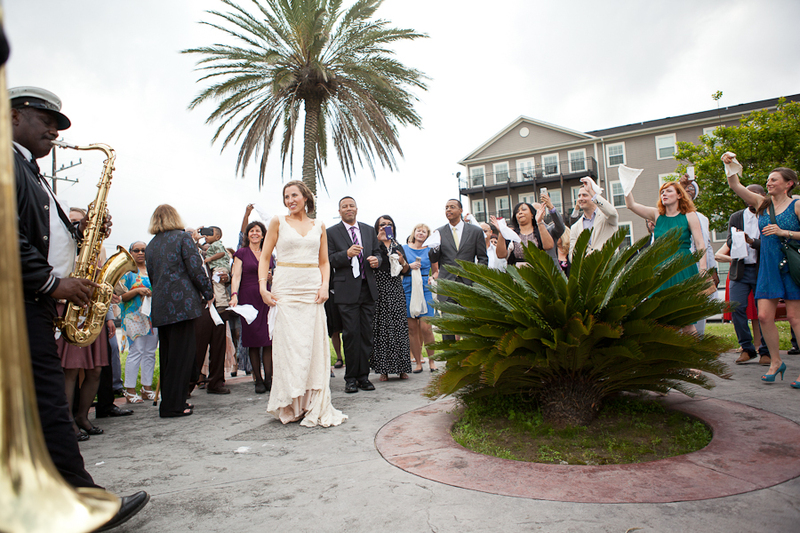 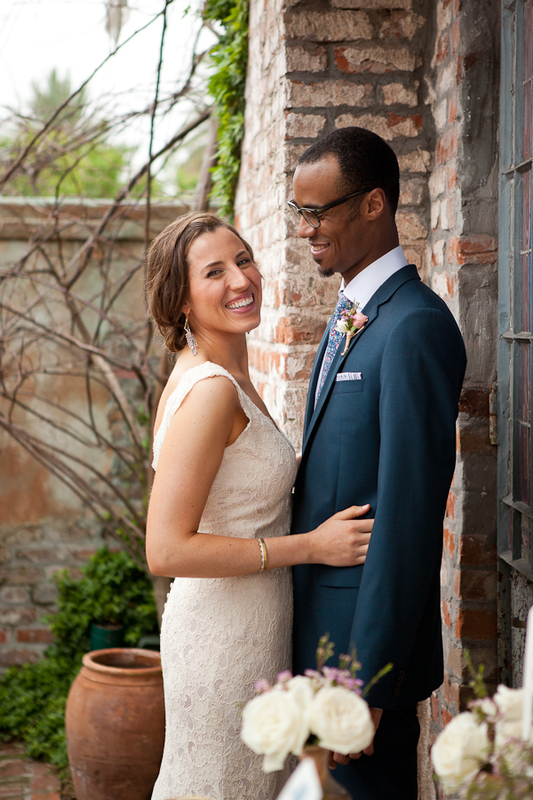 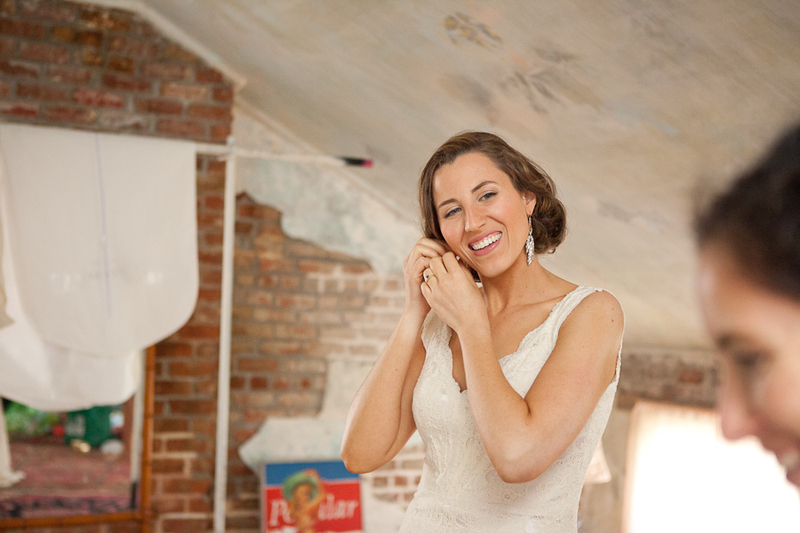 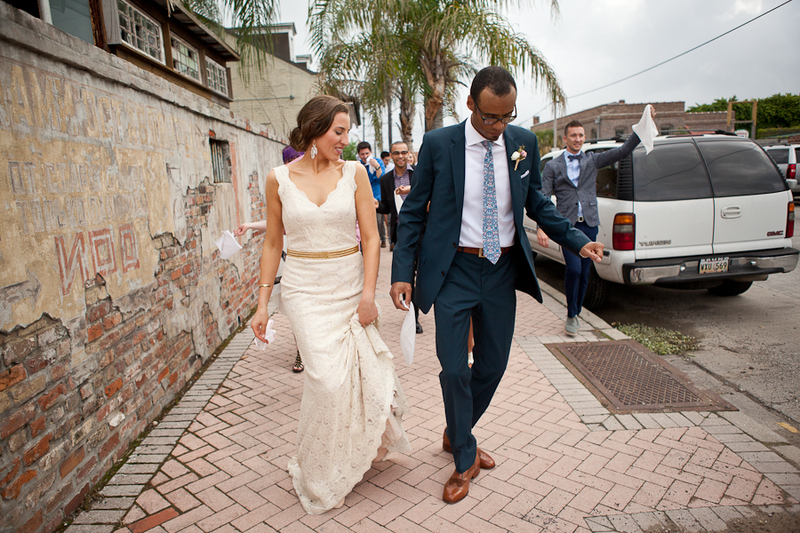 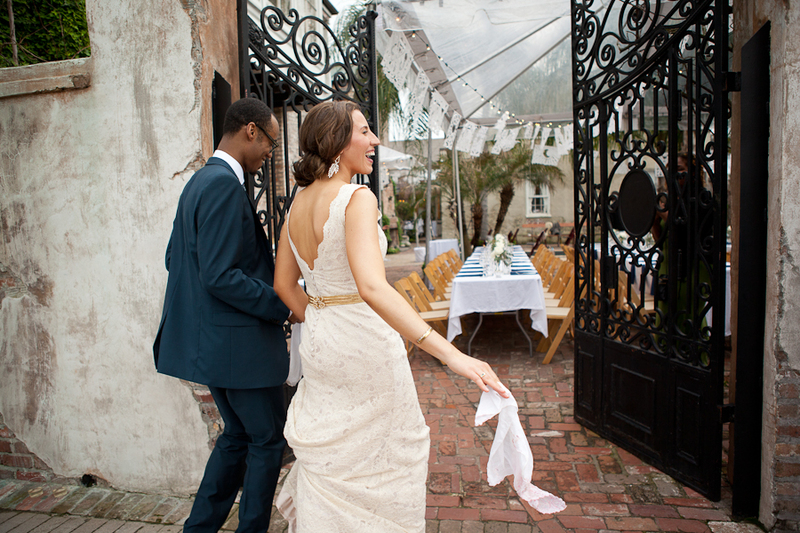 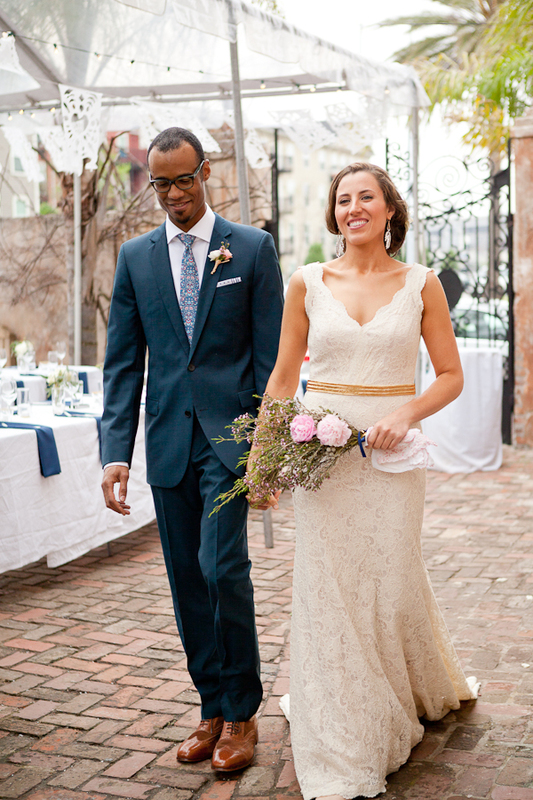 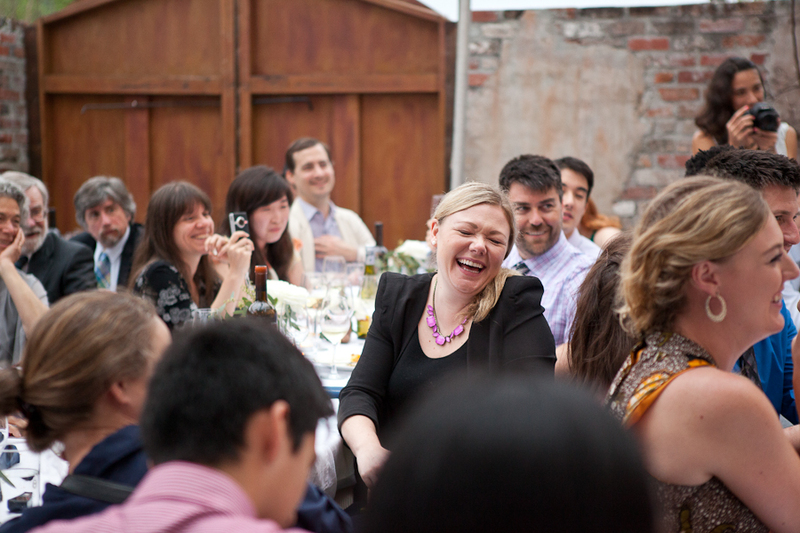 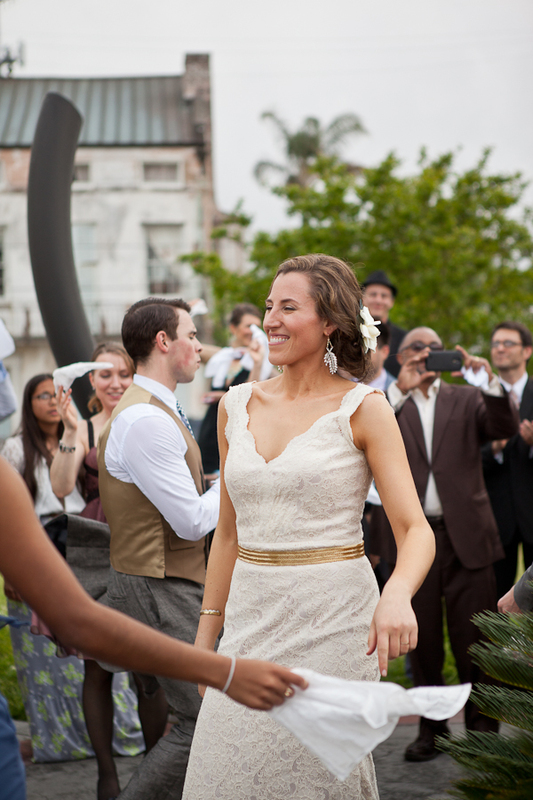 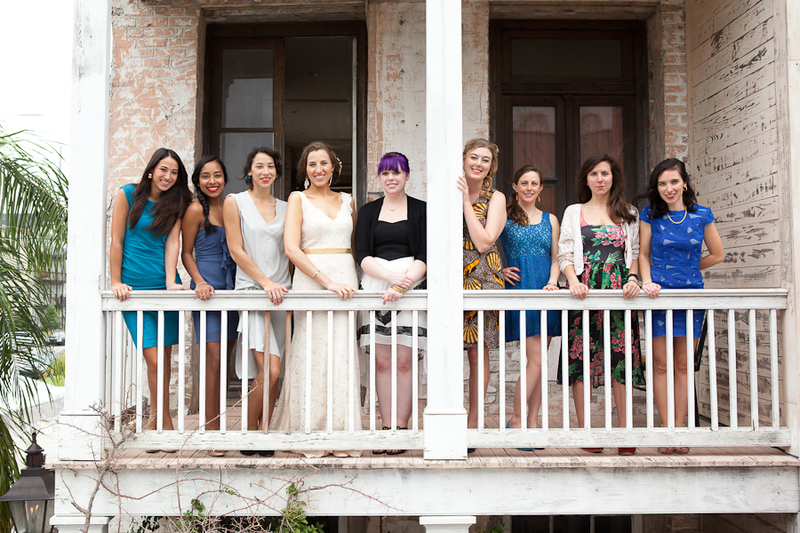 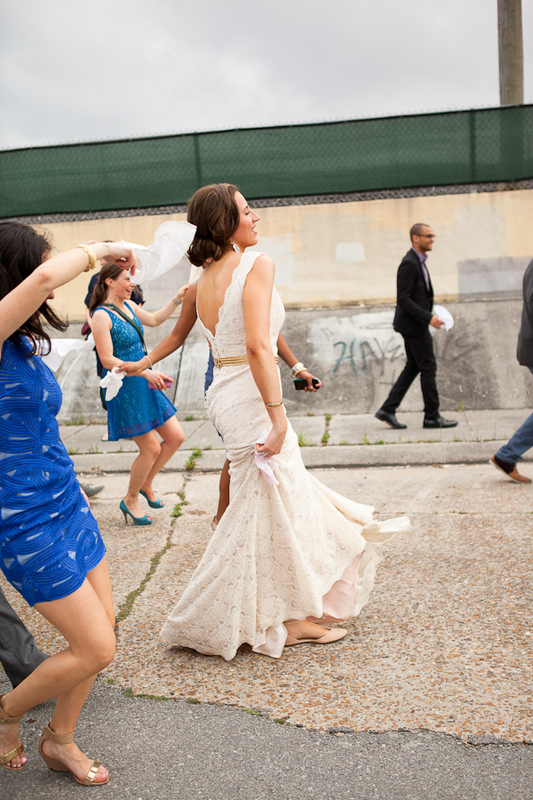 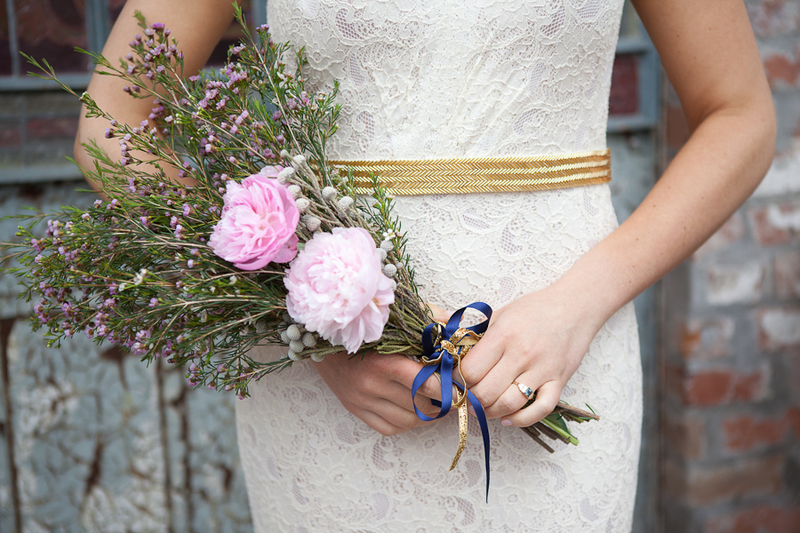 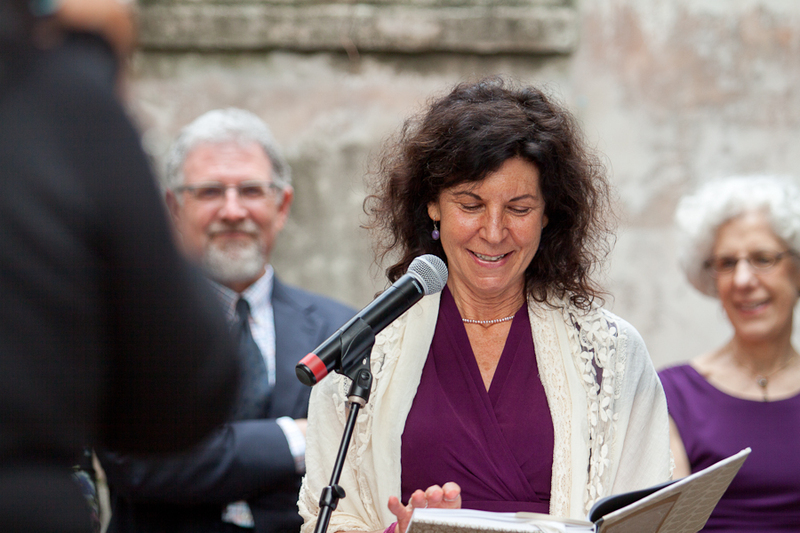 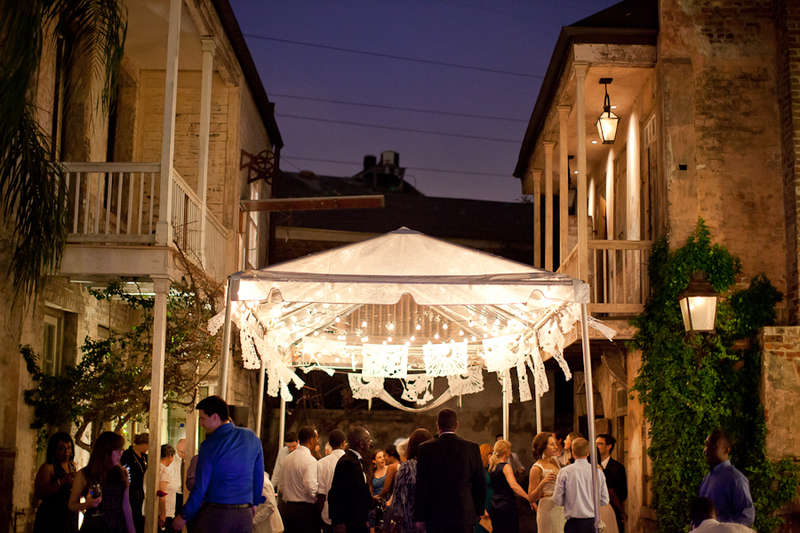 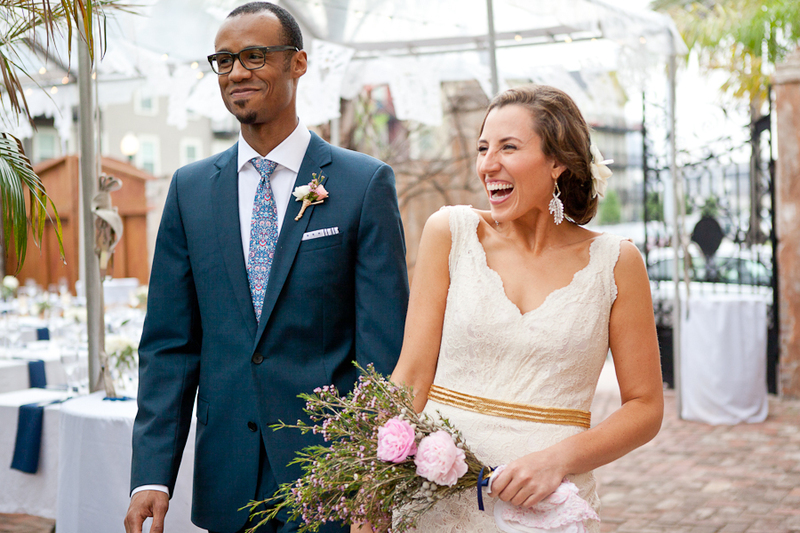 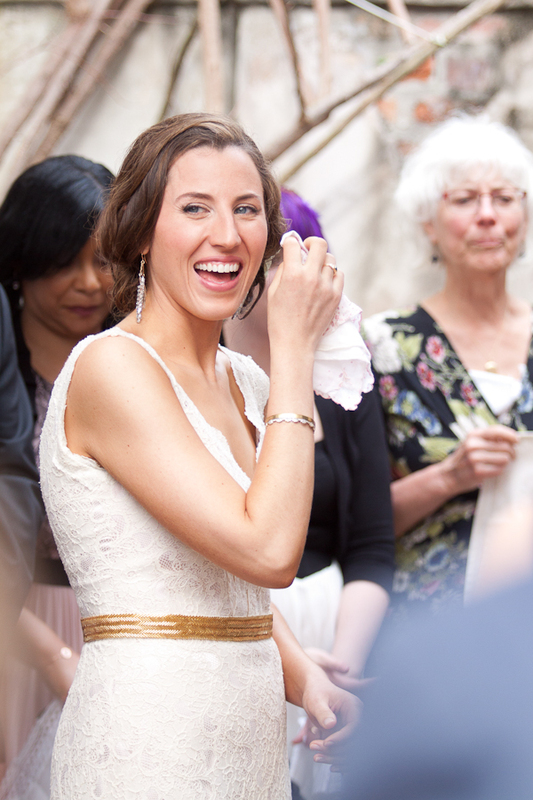 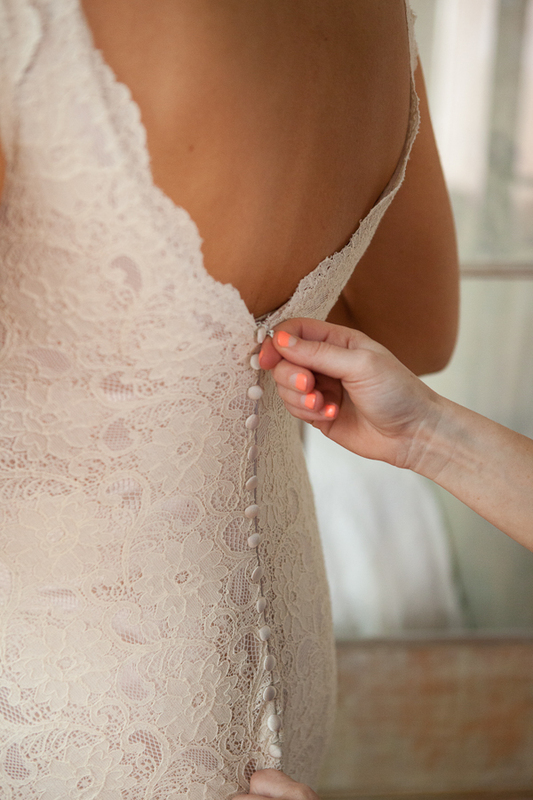 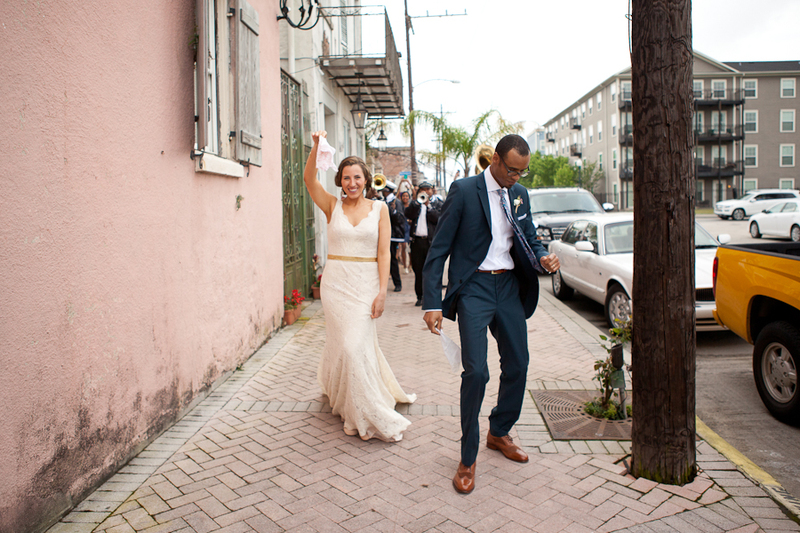 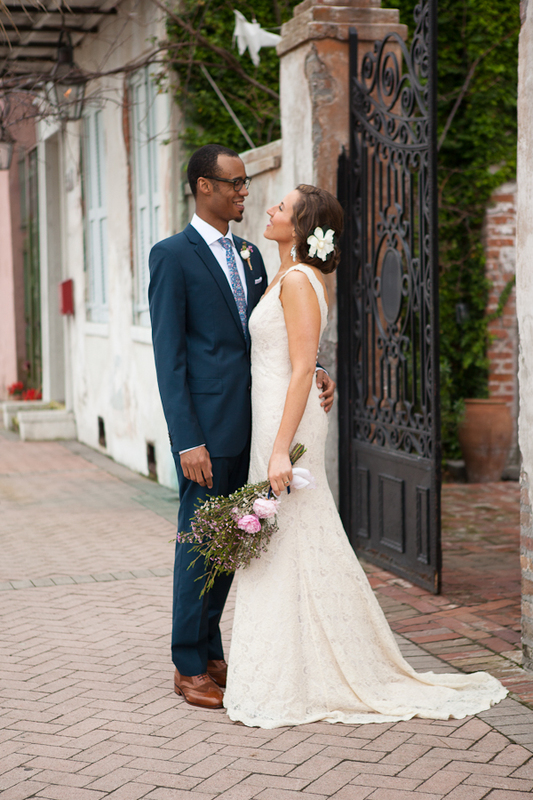 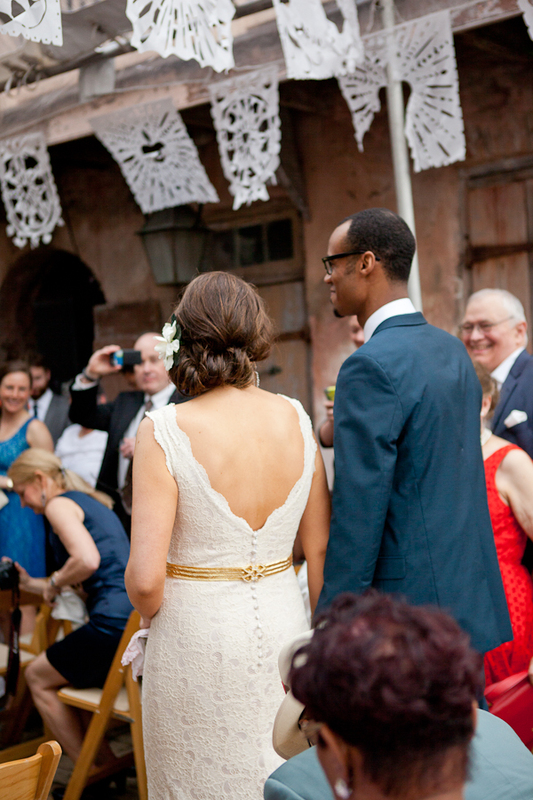 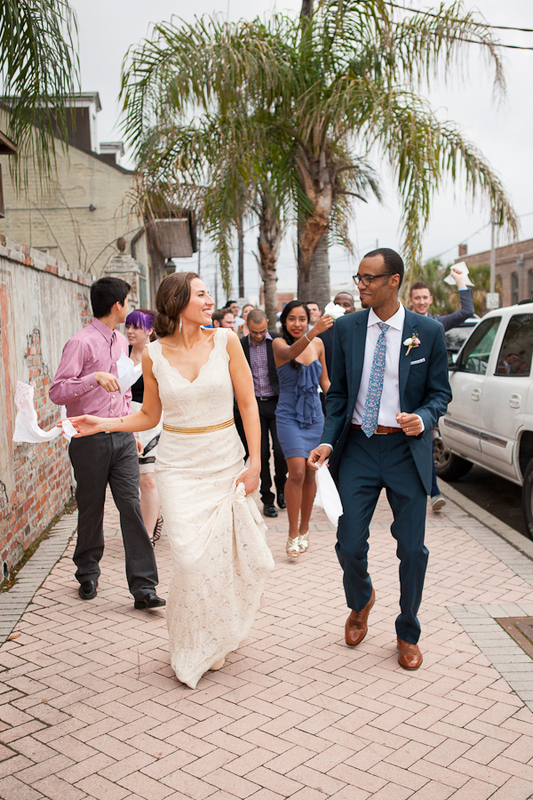 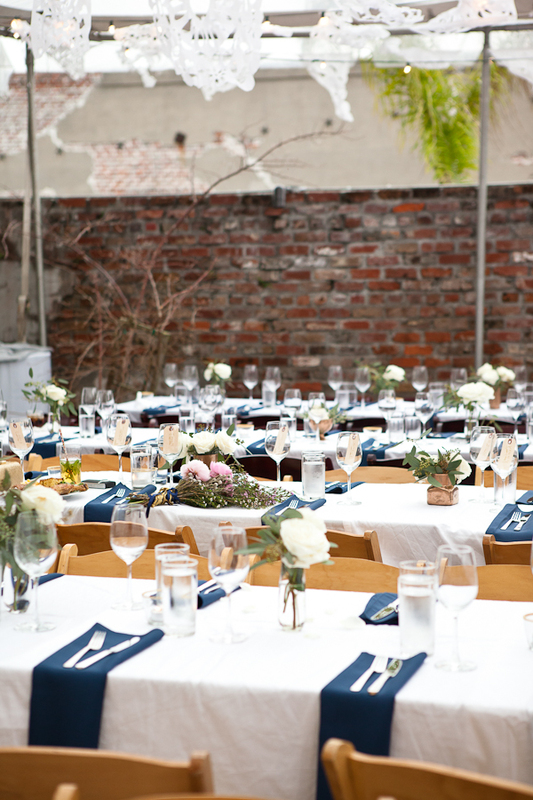 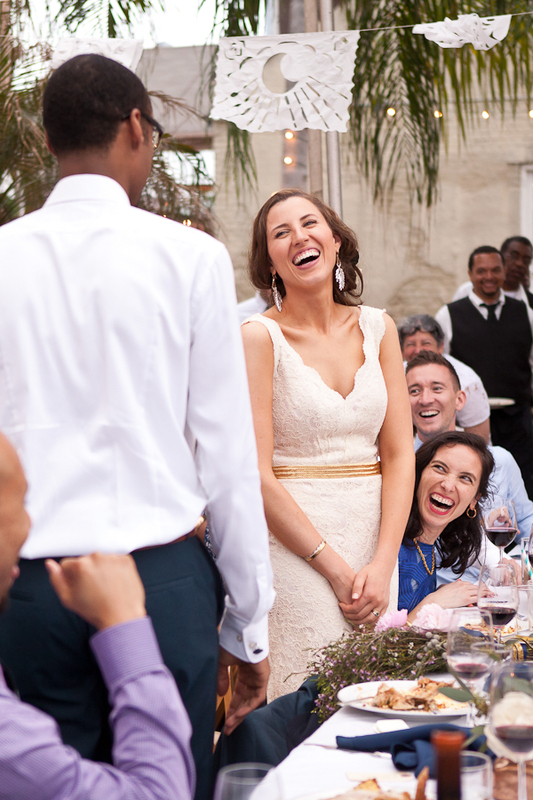 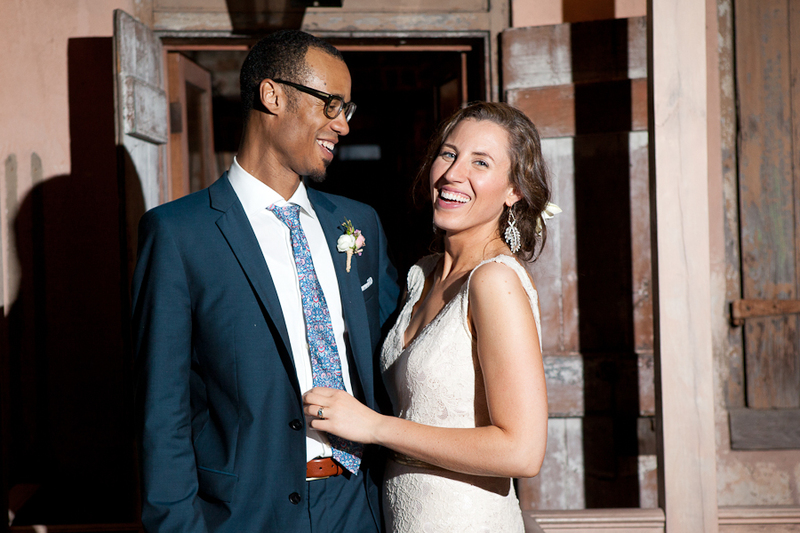 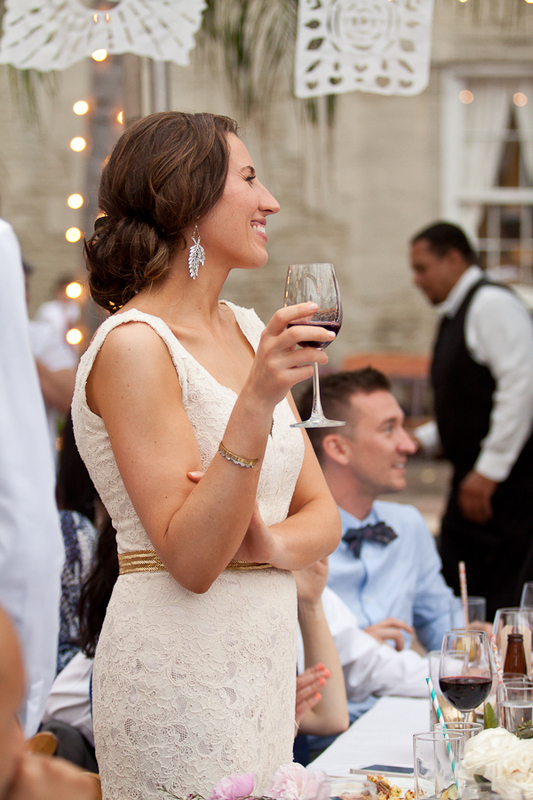 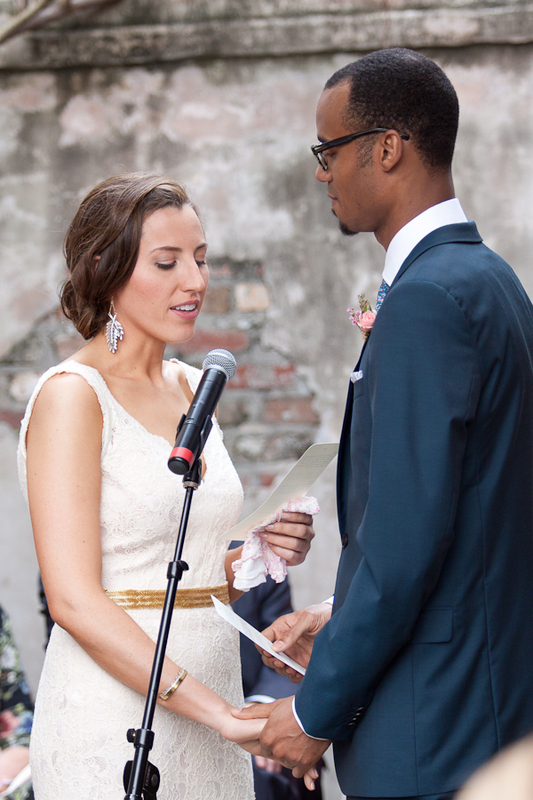 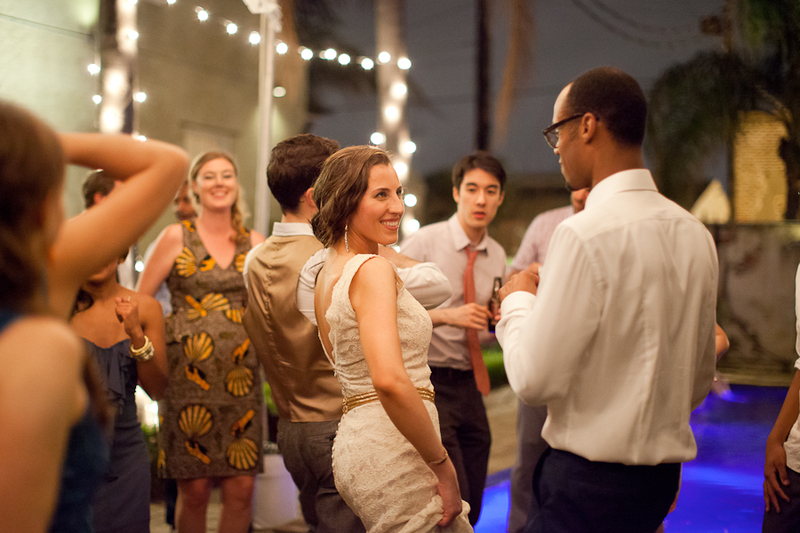 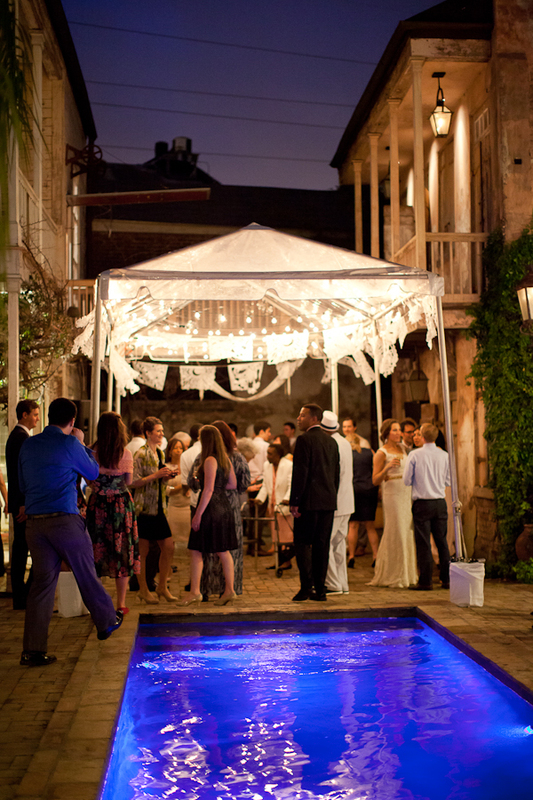 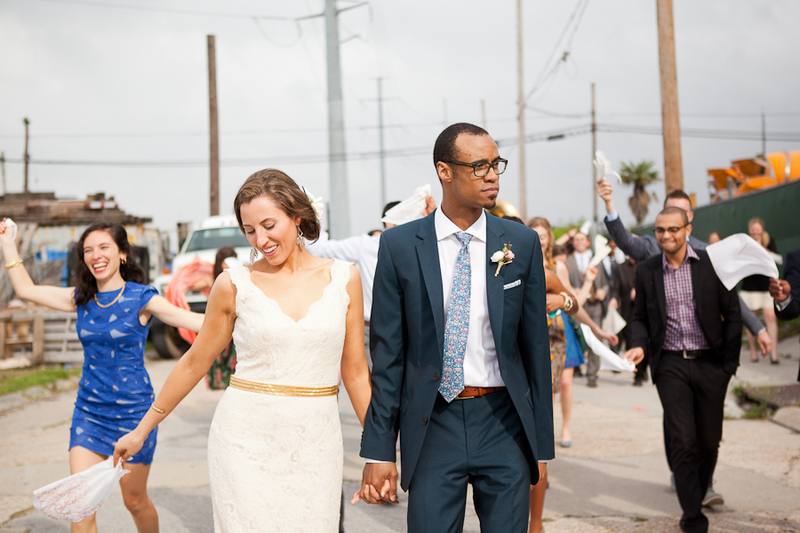 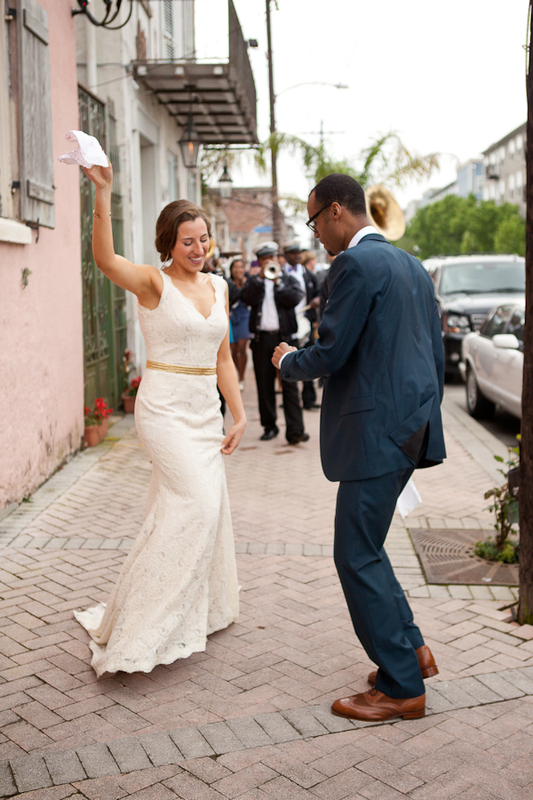 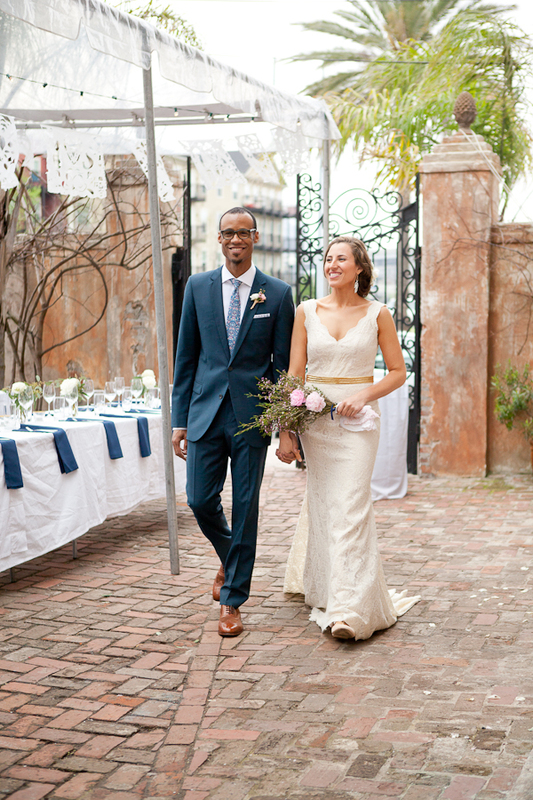 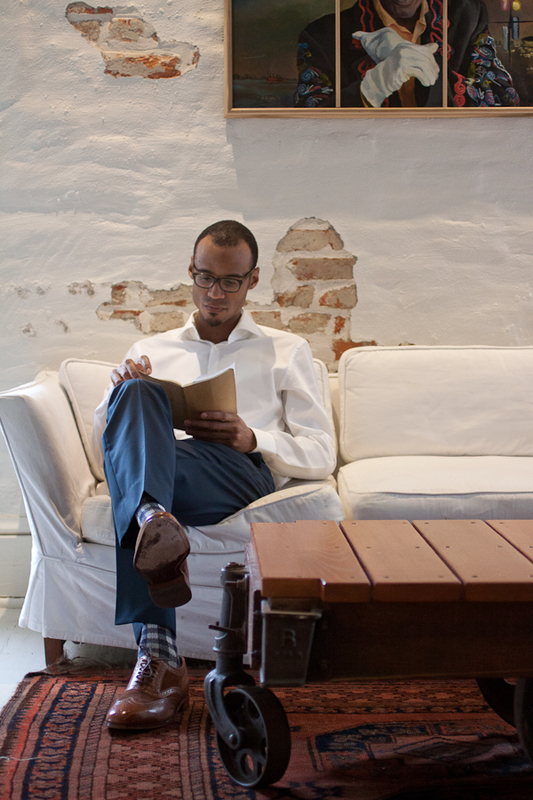 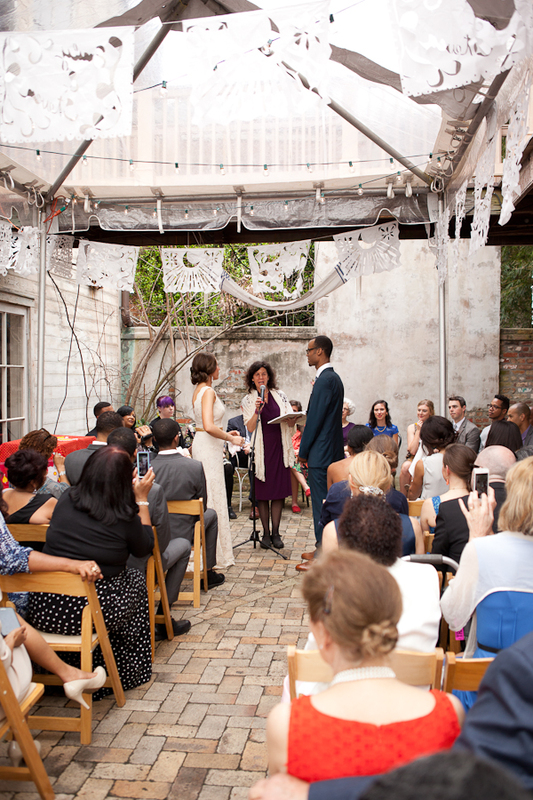 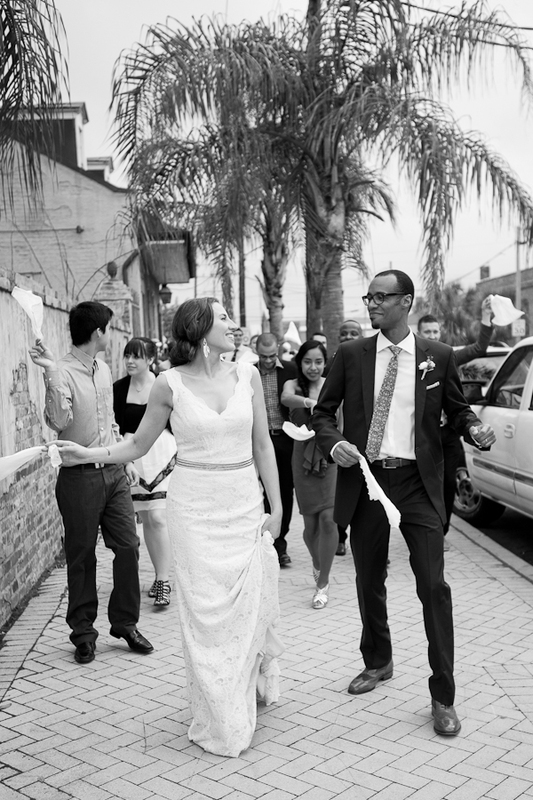 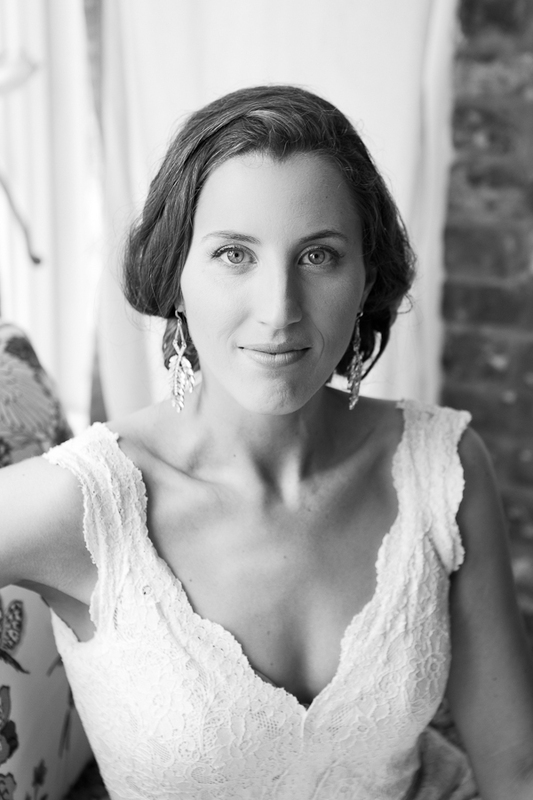 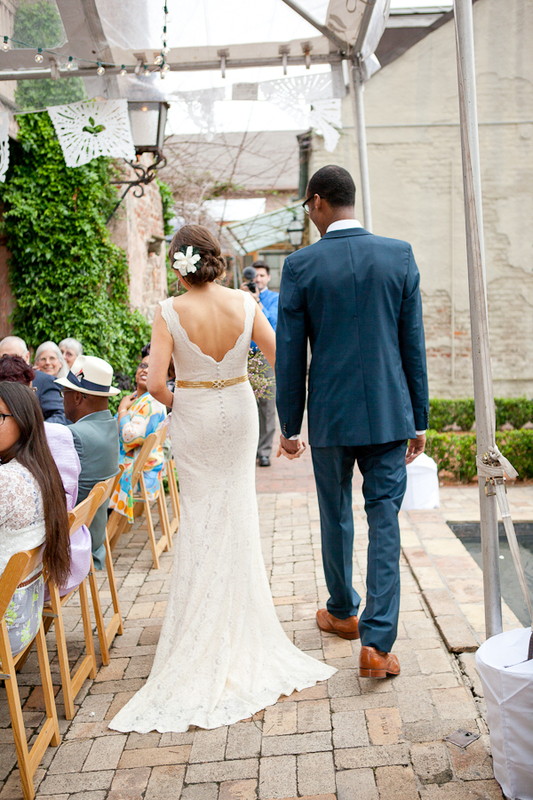 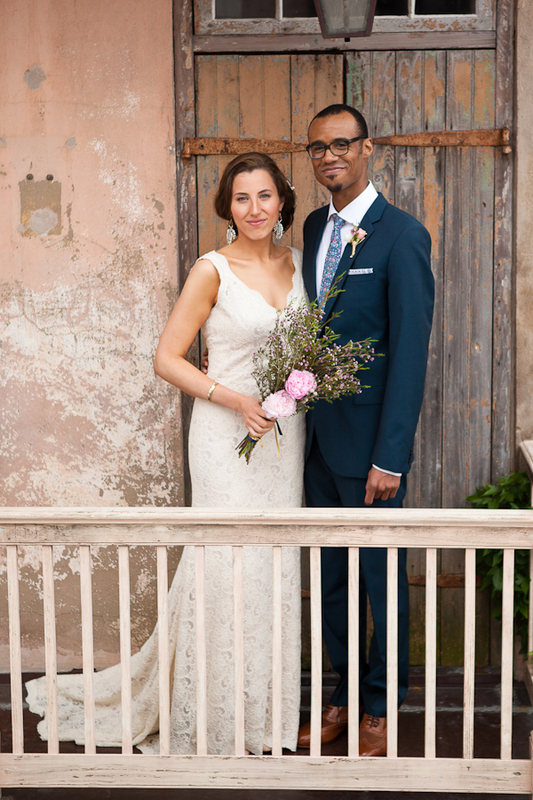 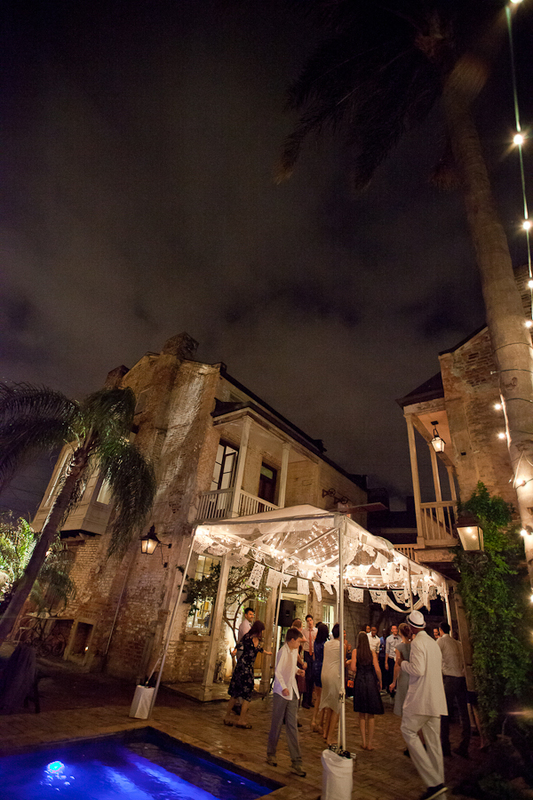 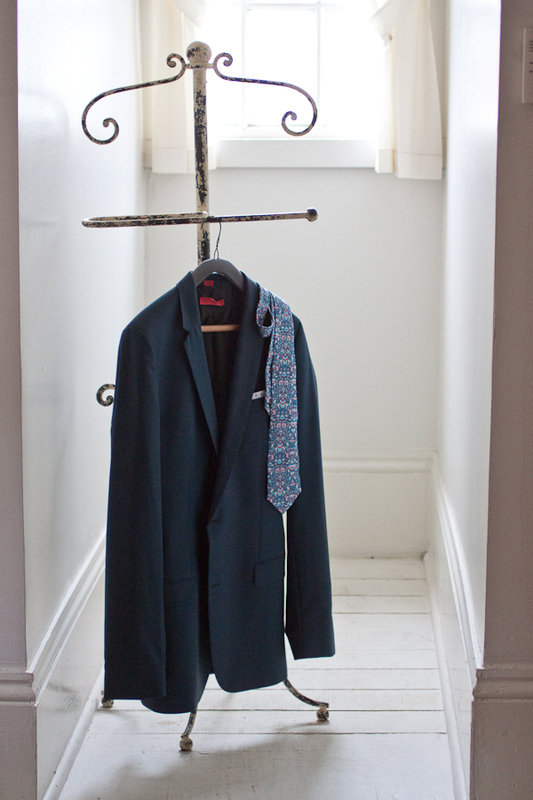 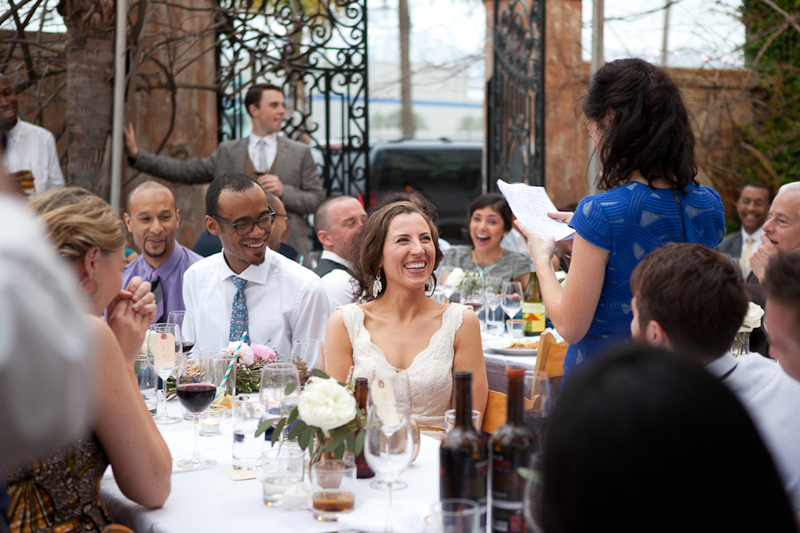 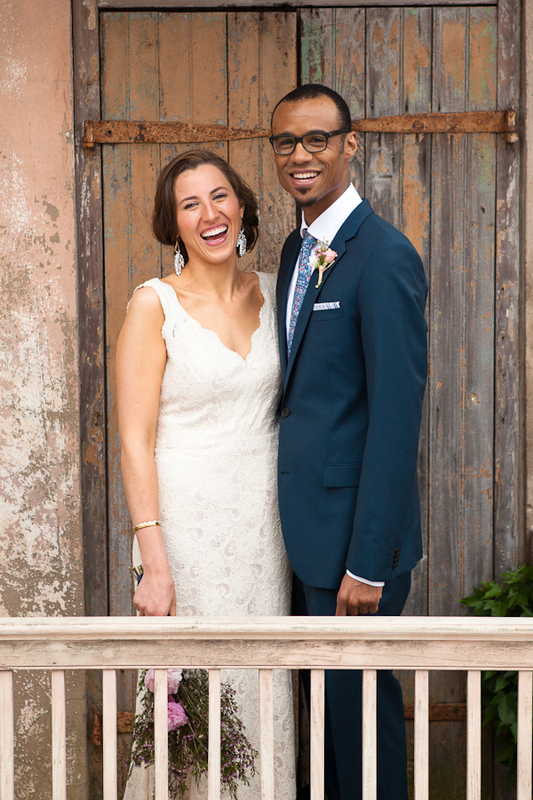 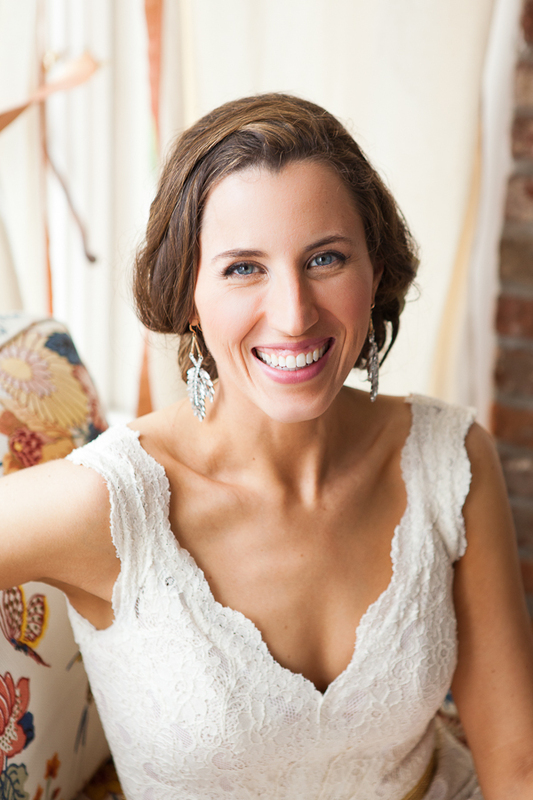 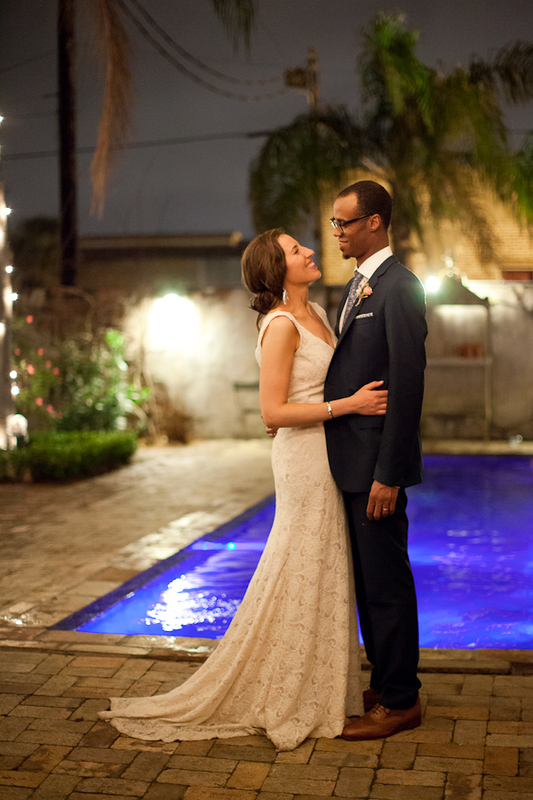 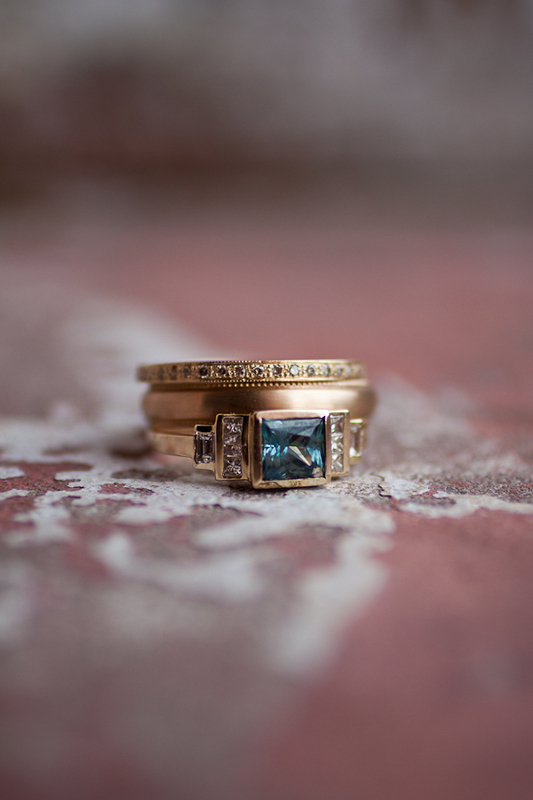 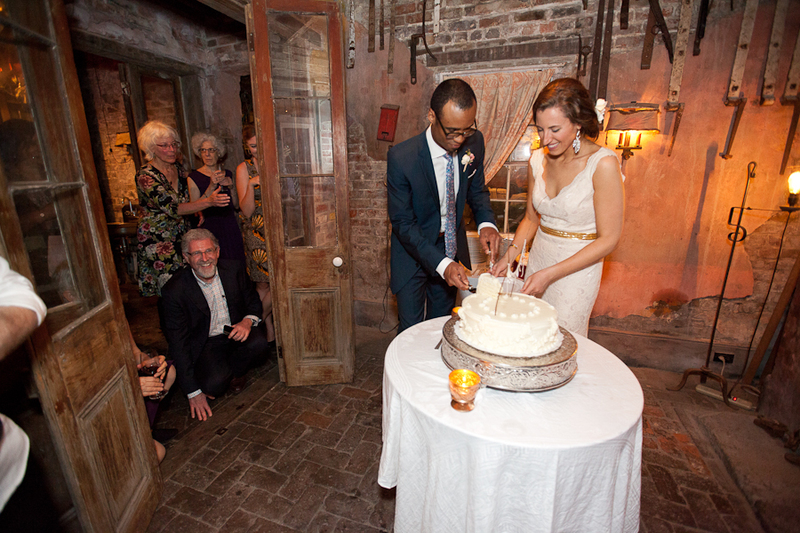 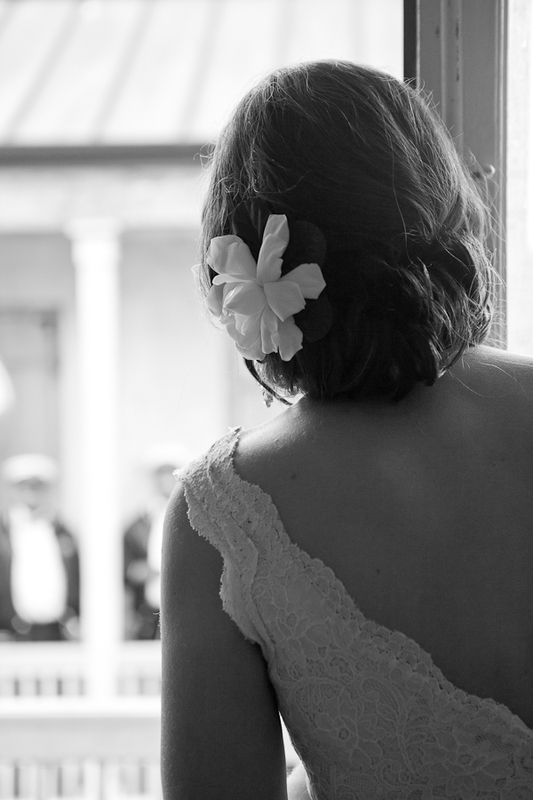 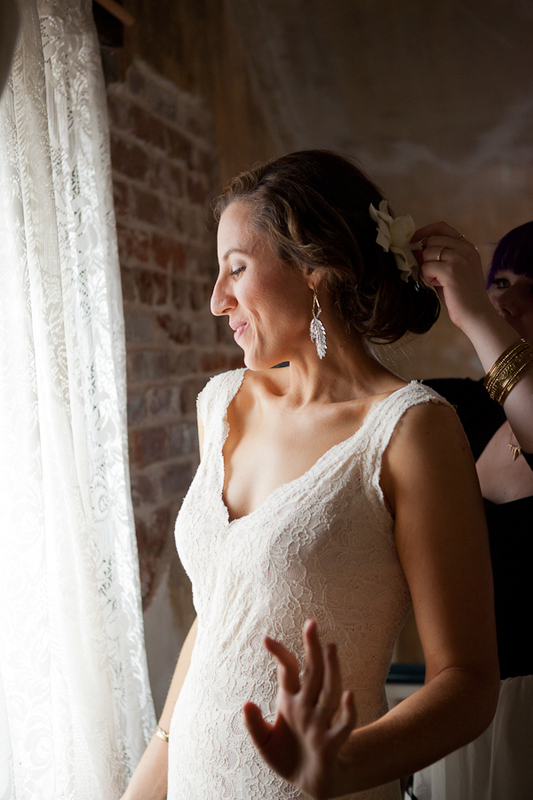 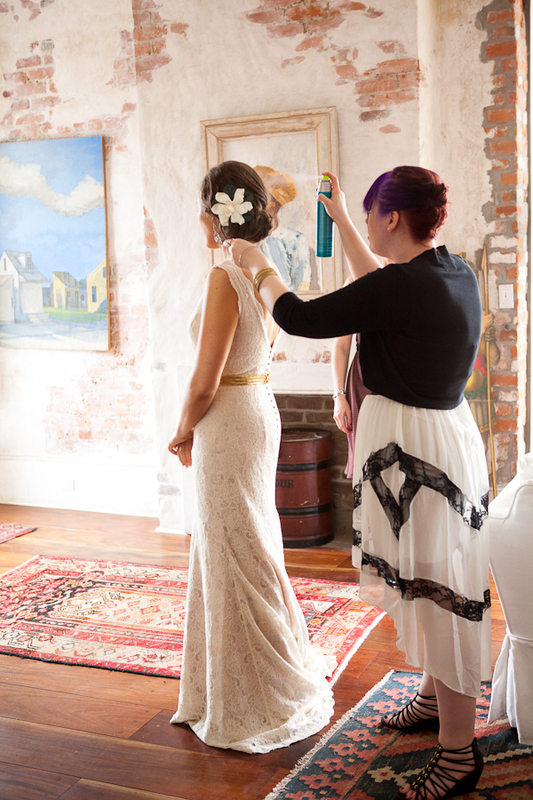 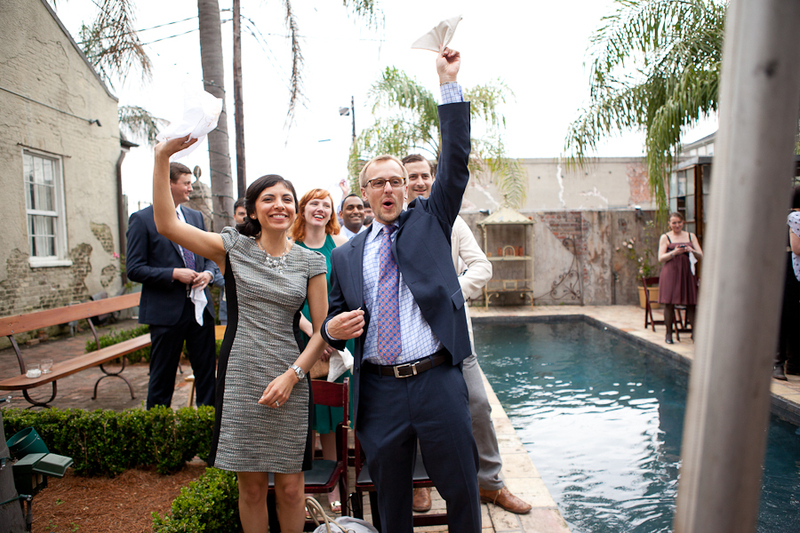 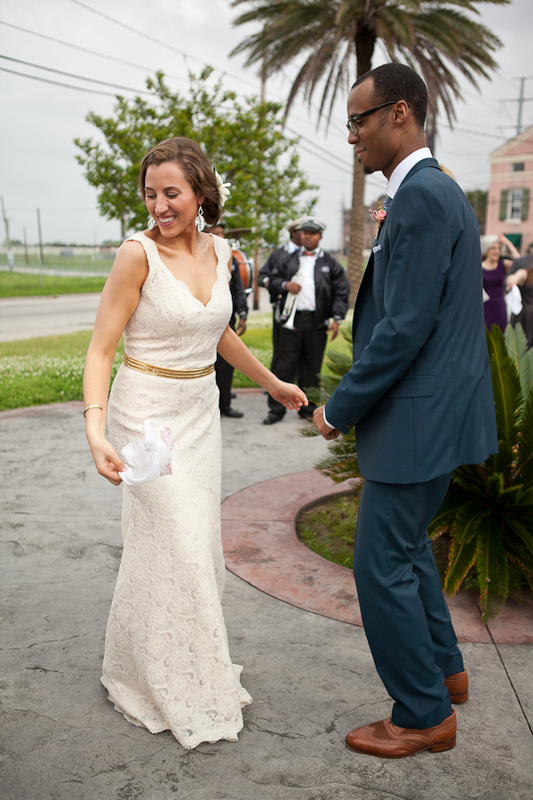 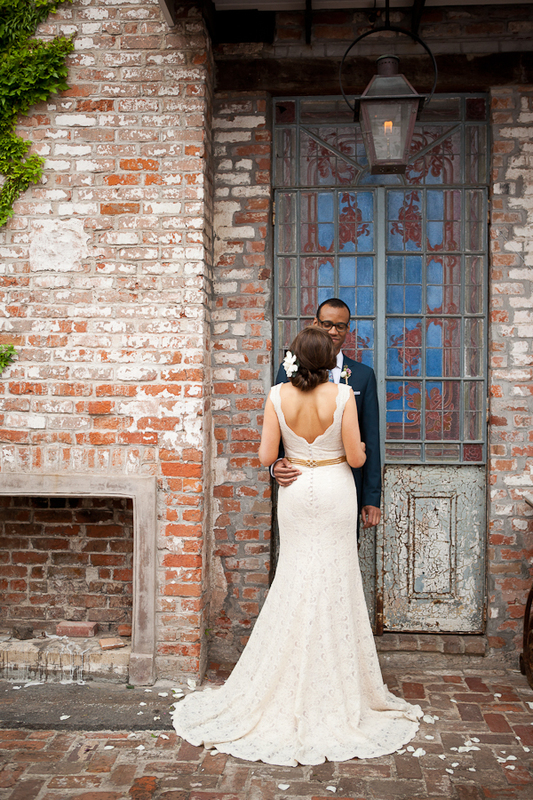 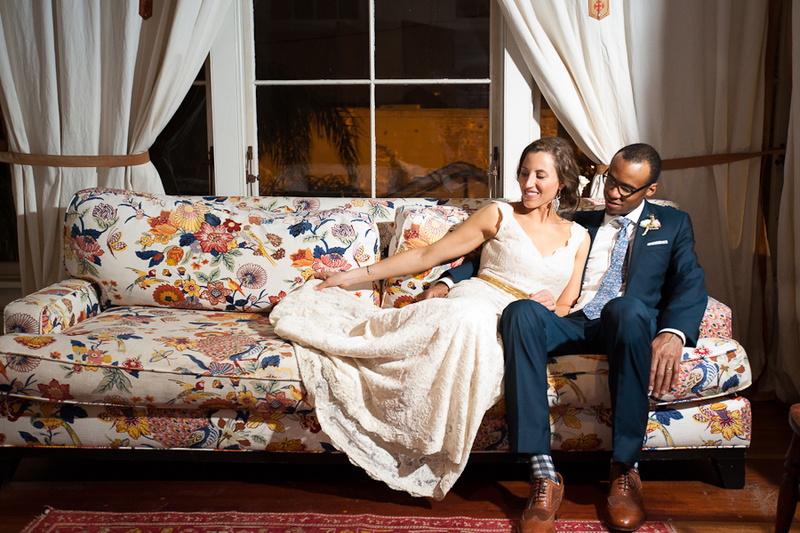 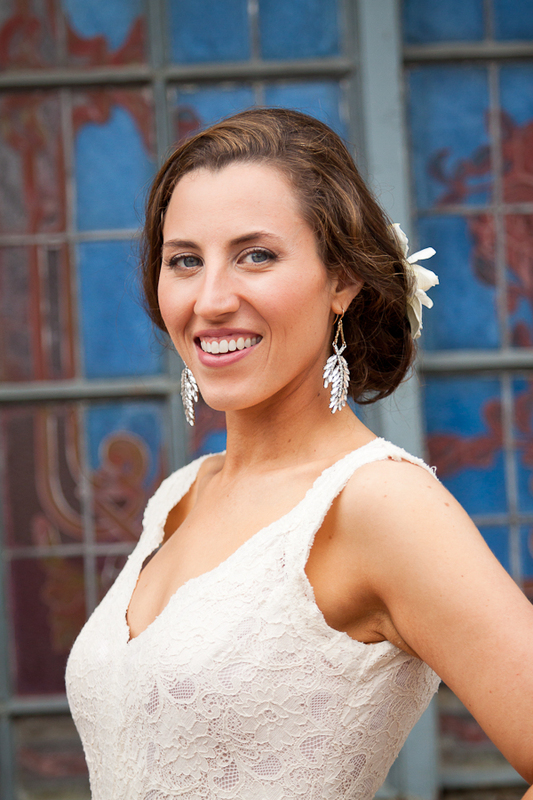 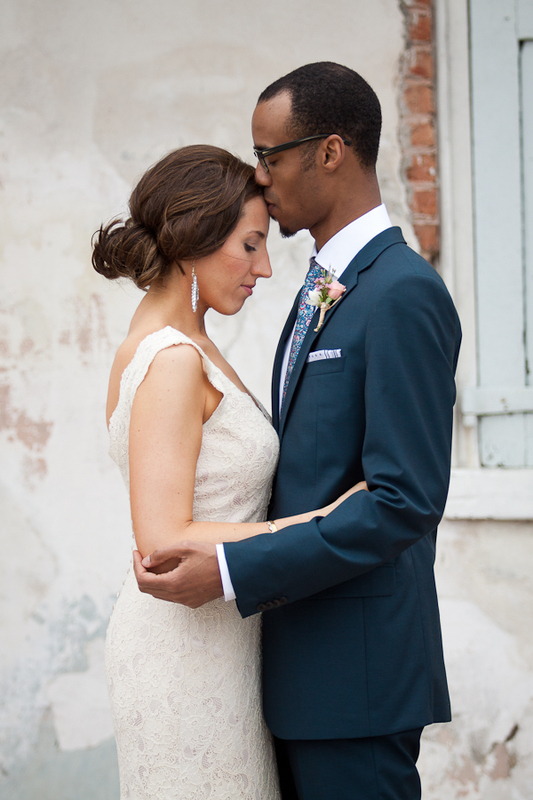 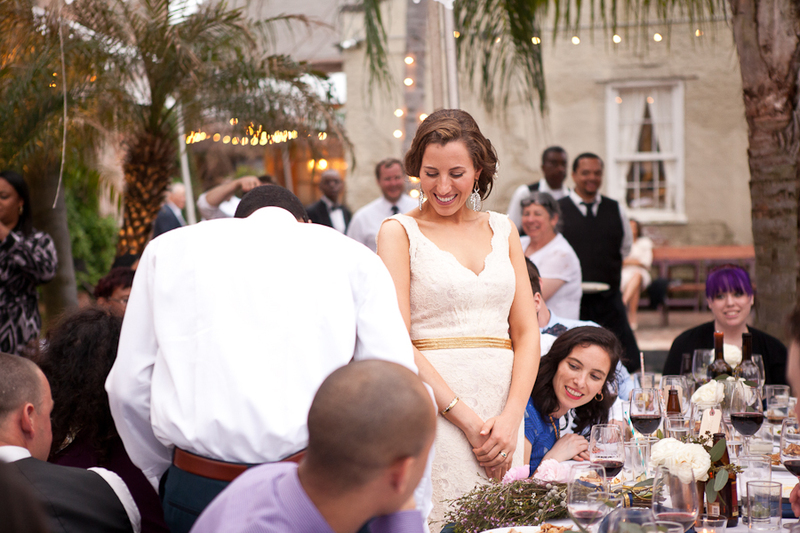 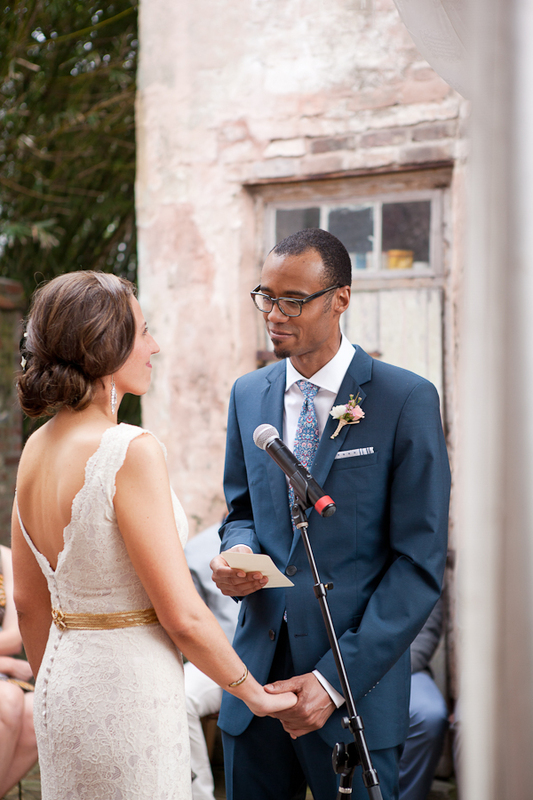 Emily and Steve were married at Race and Religious in New Orleans, LA earlier this month. 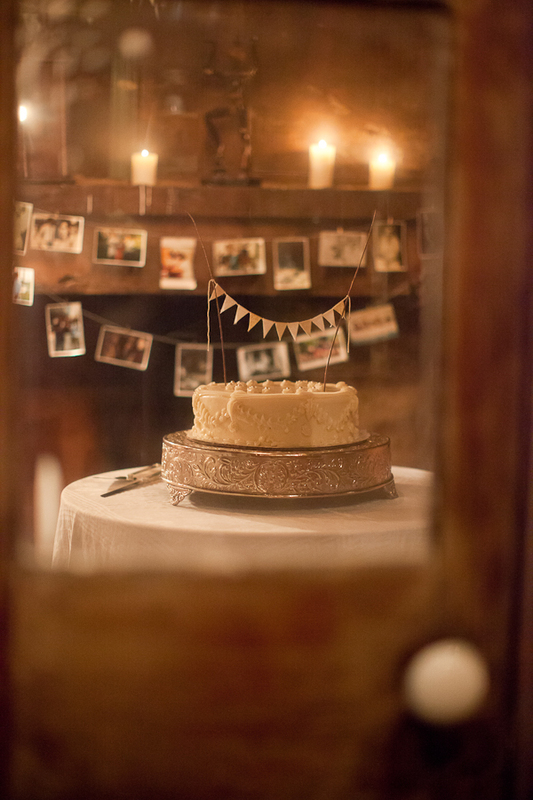 This was an absolutely gorgeous wedding to get to photograph, there were so many little details I couldn’t even fit all of them into the handful of photos I’ve put below, but the little details paled in comparison to the love and laughter brought to this wedding by the bride and groom and their friends and family. 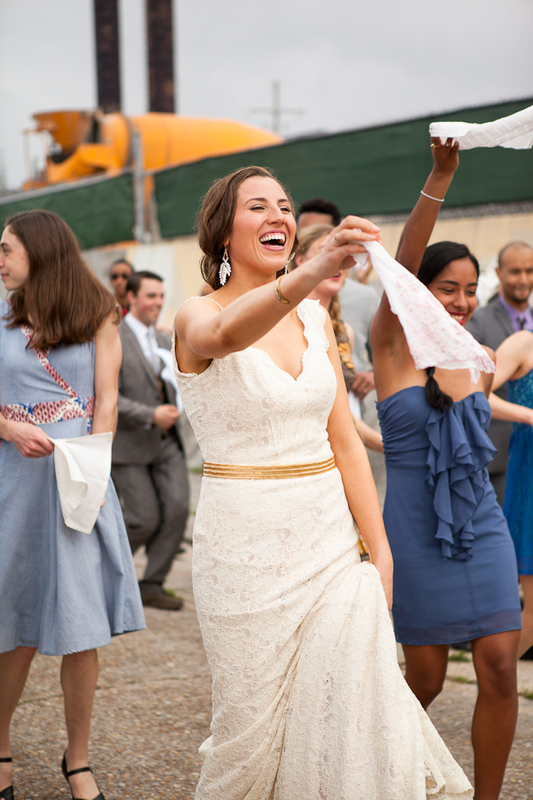 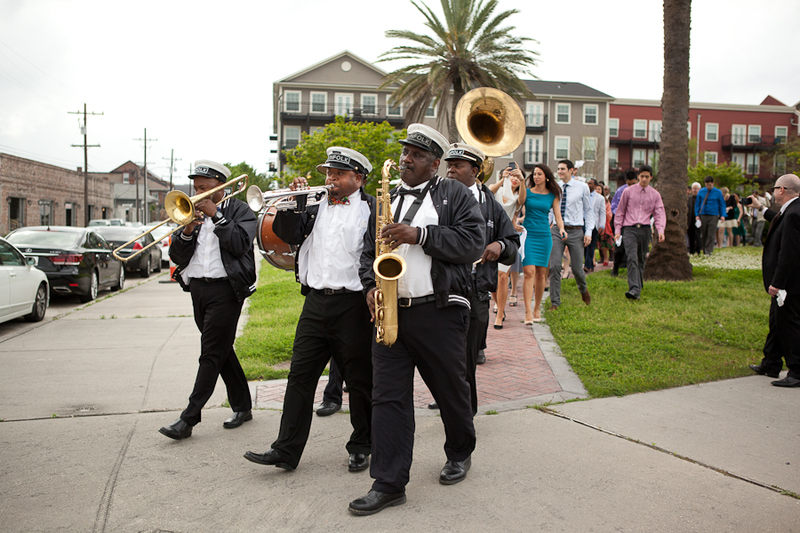 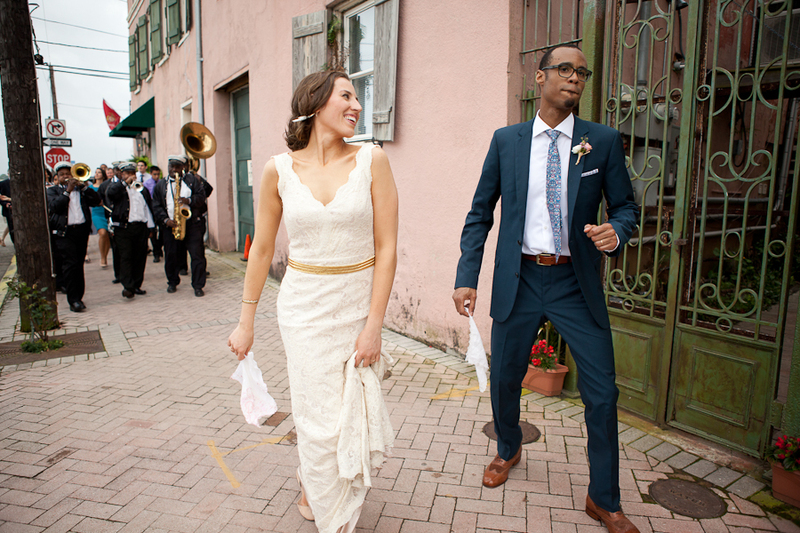 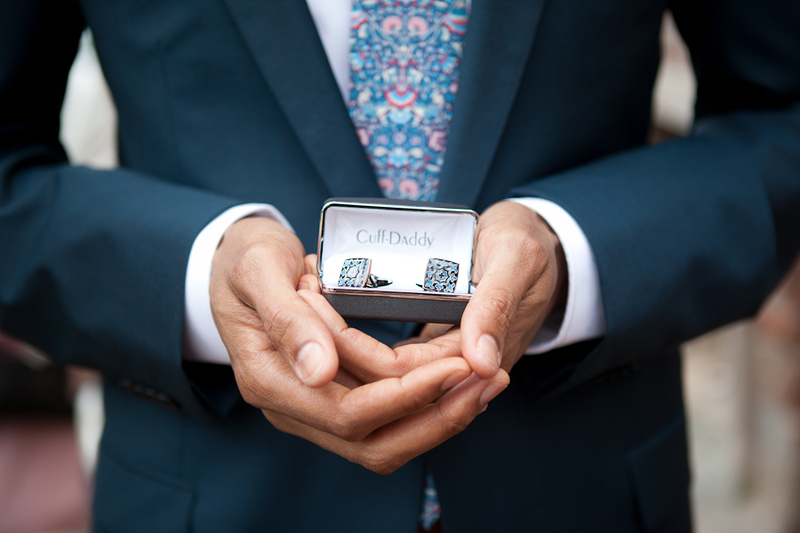 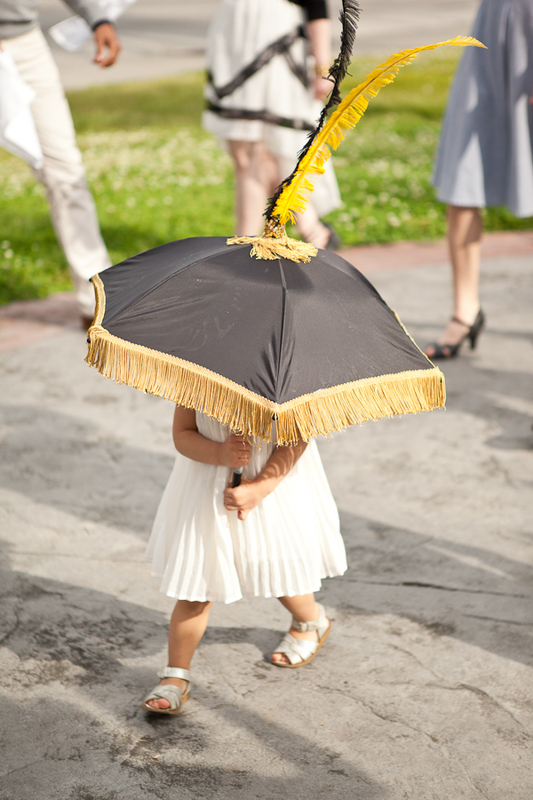 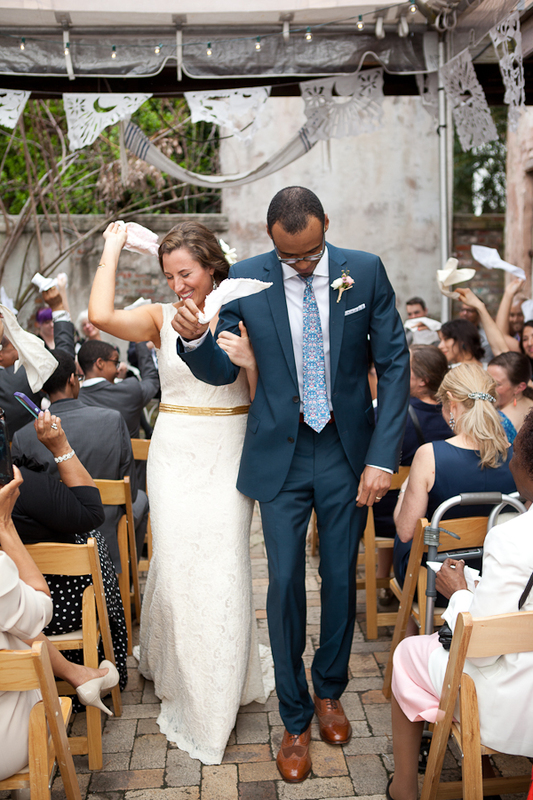 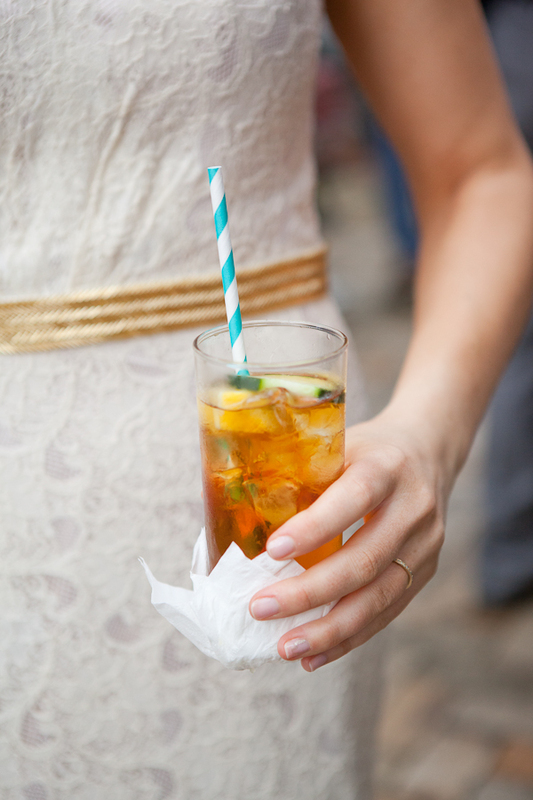 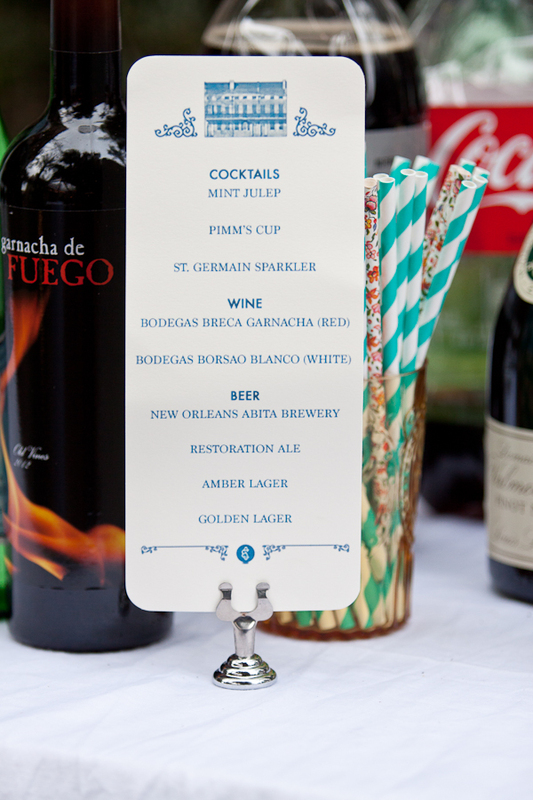 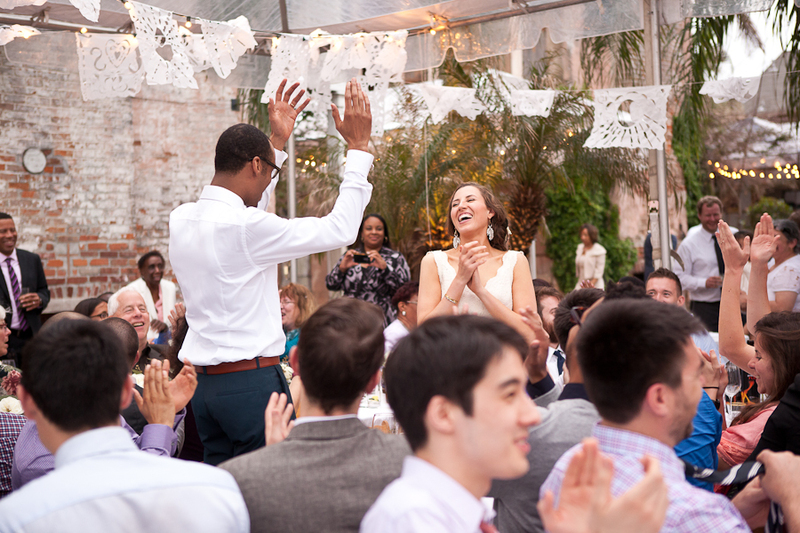 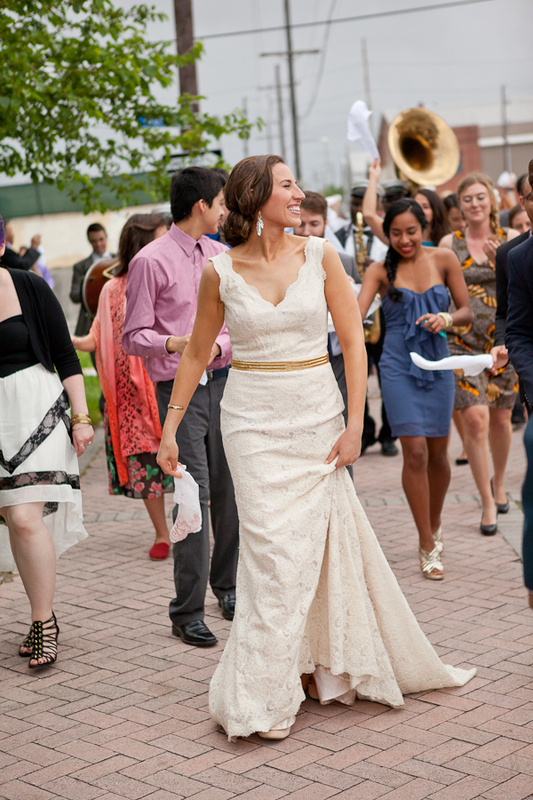 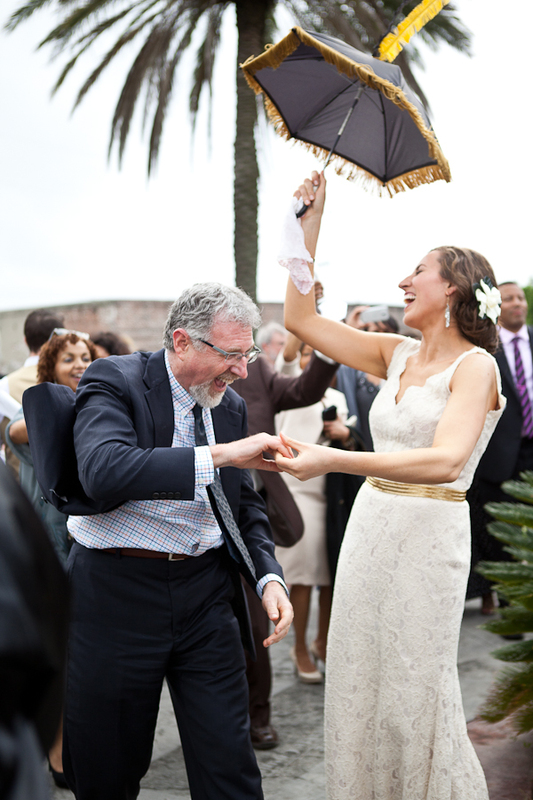 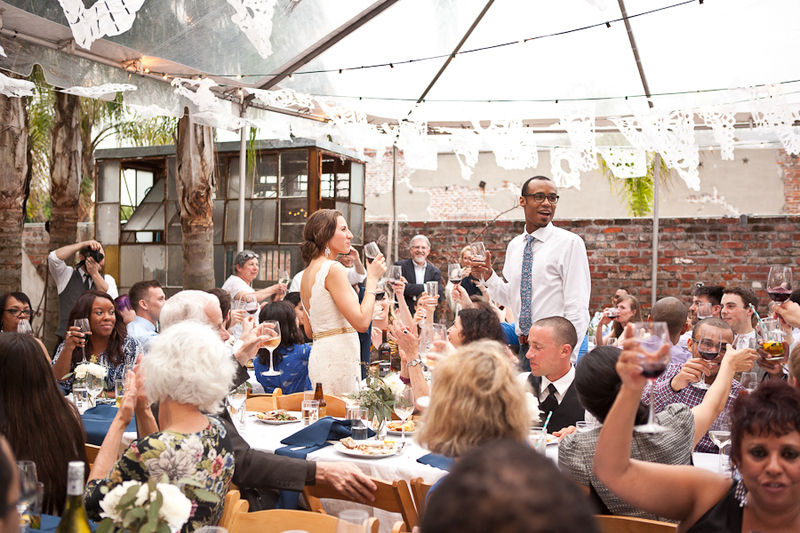 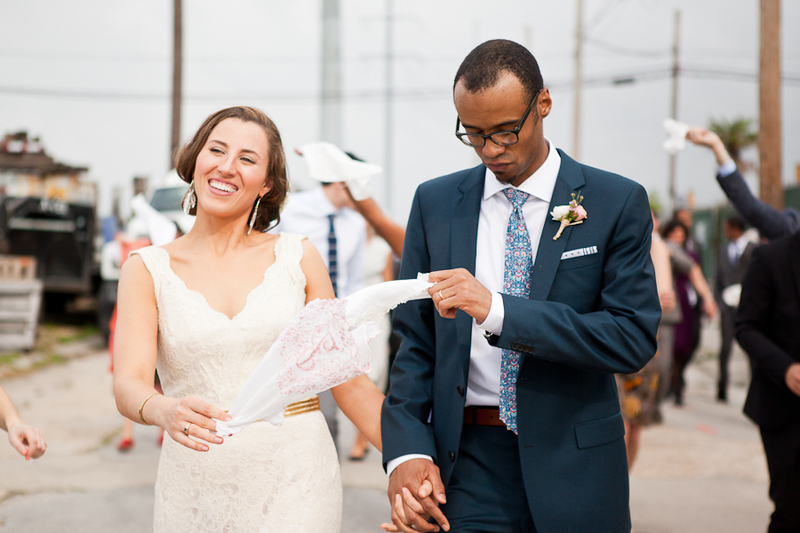 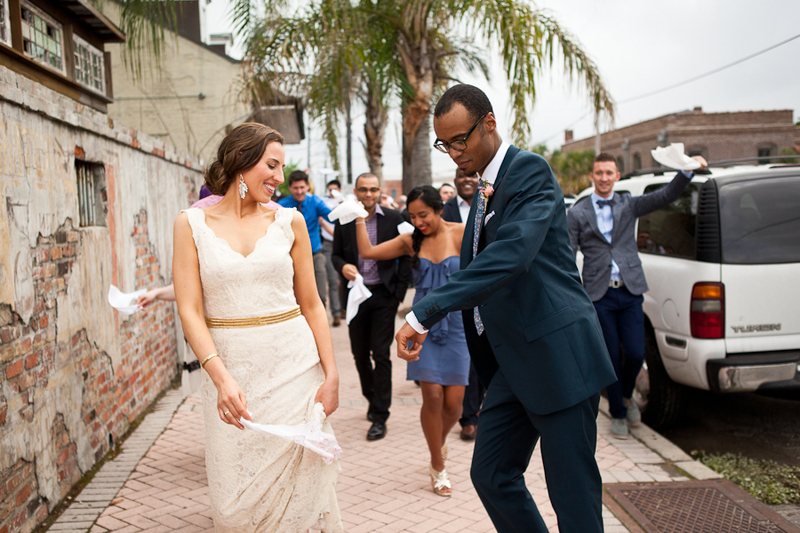 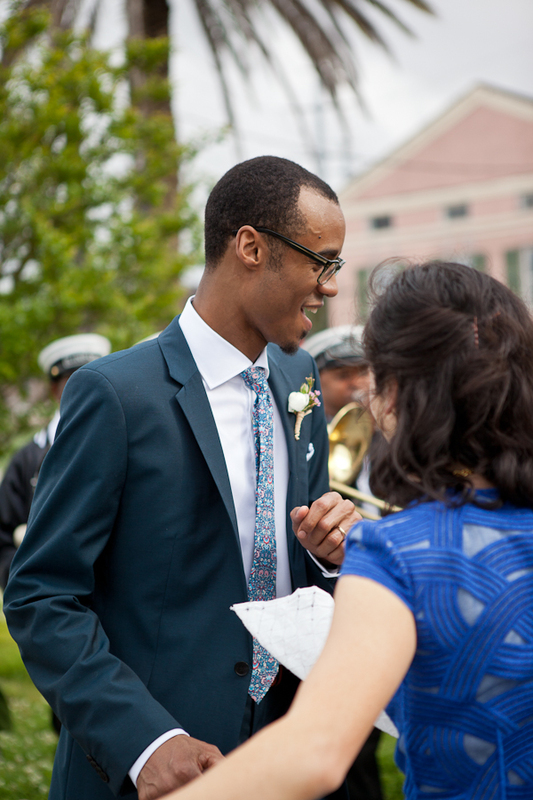 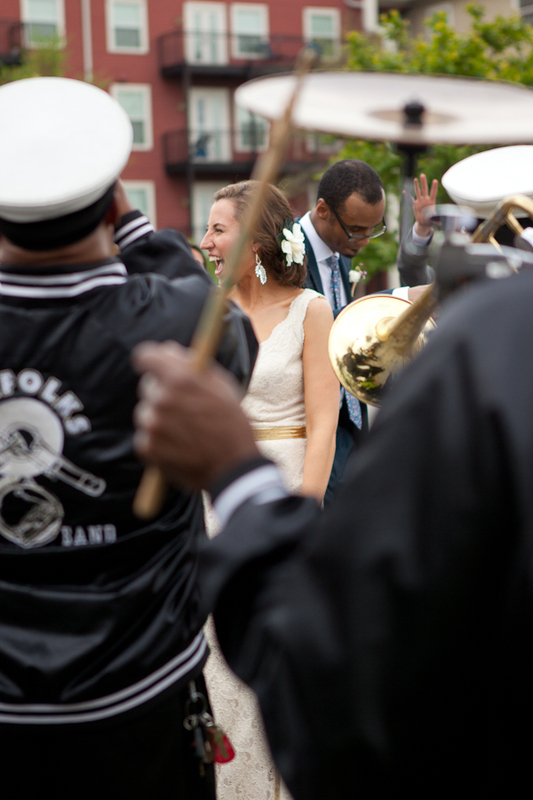 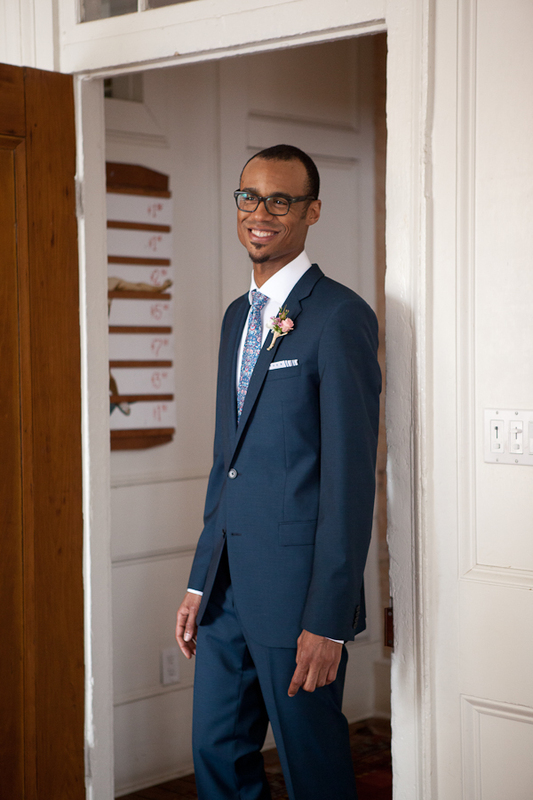 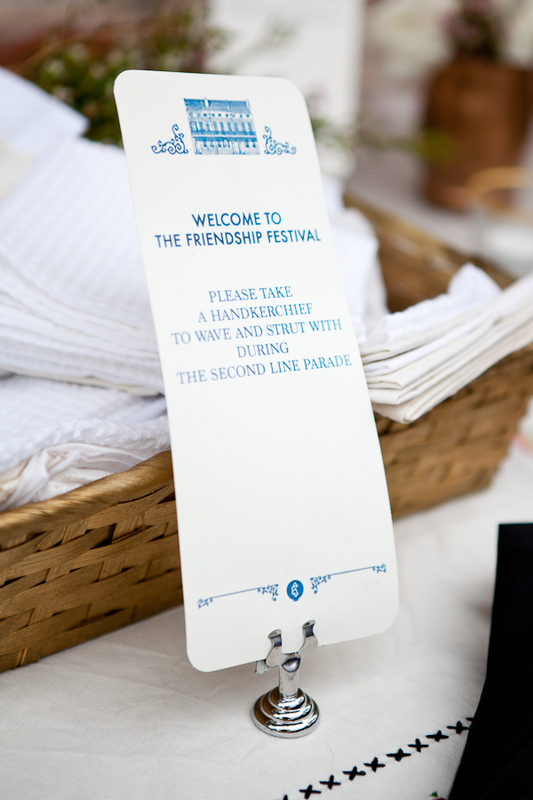 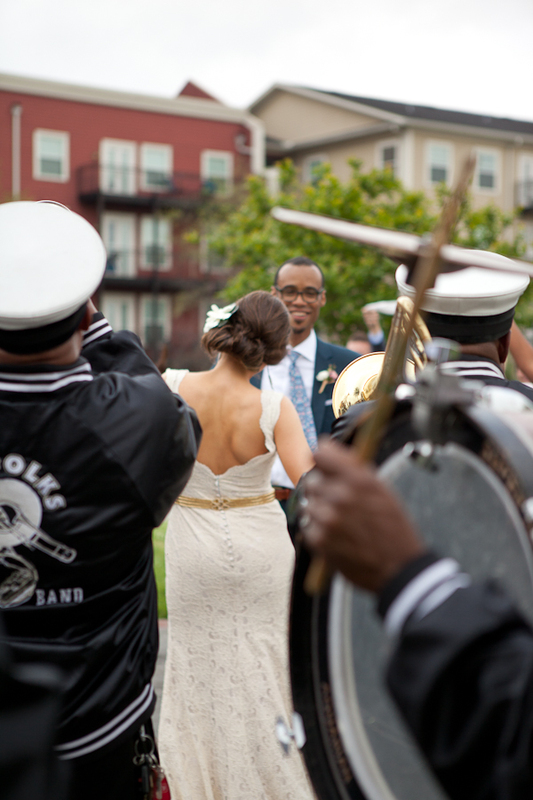 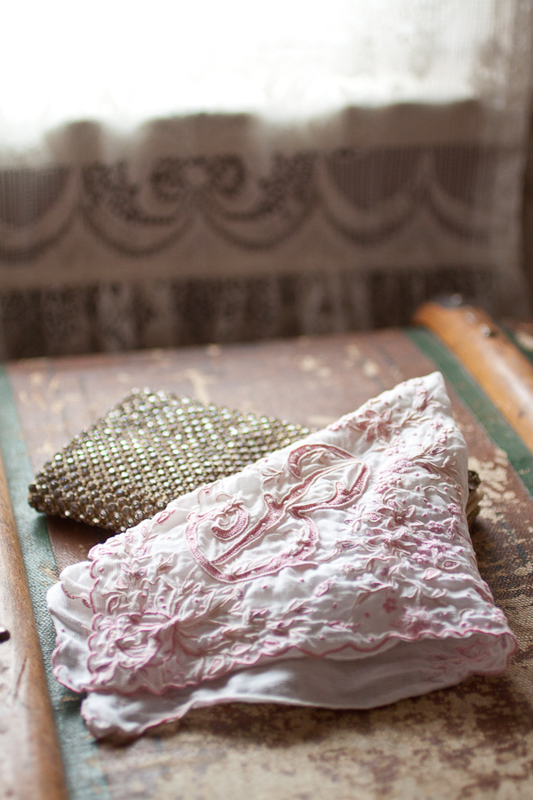 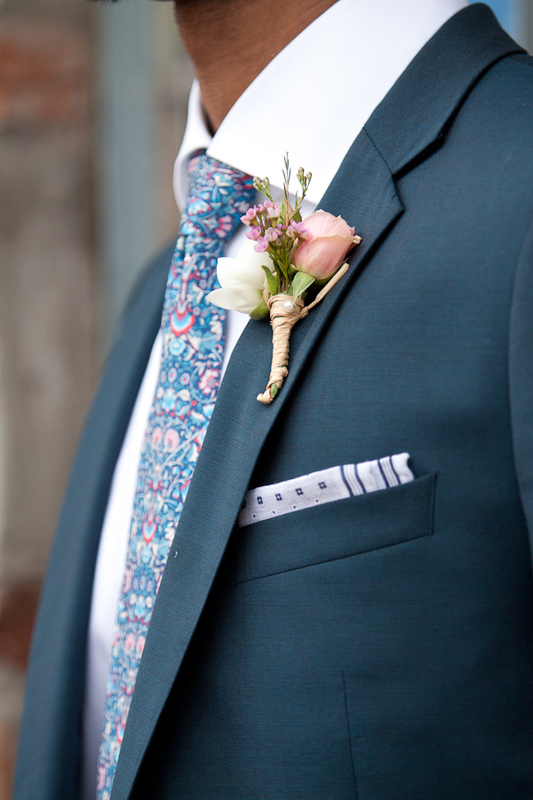 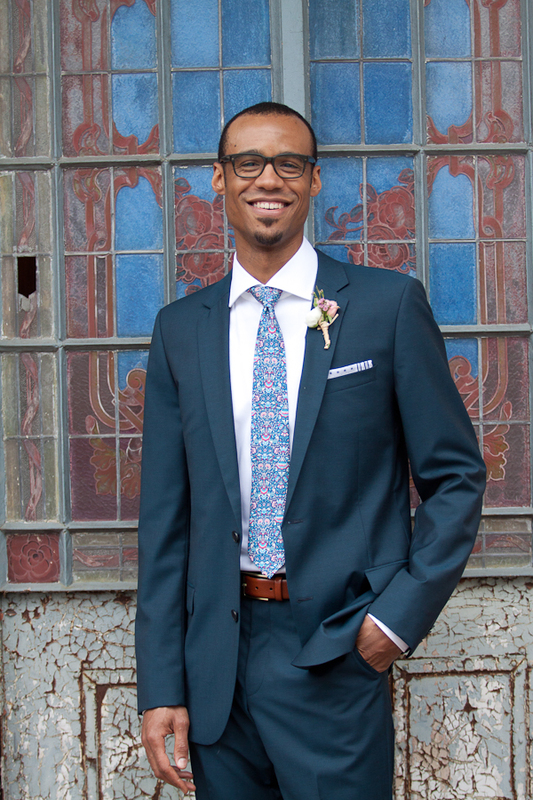 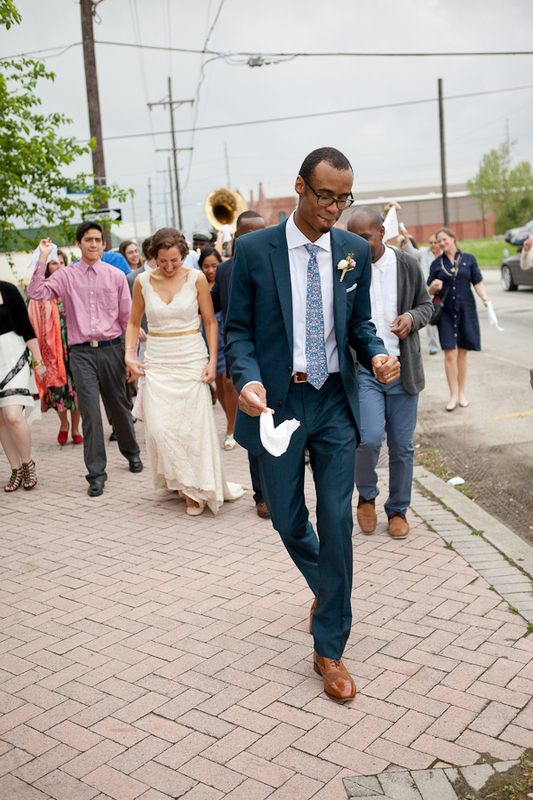 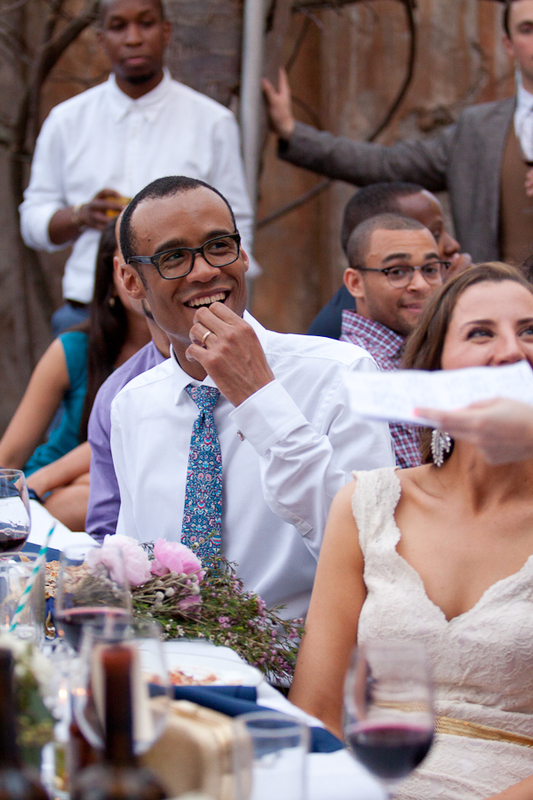 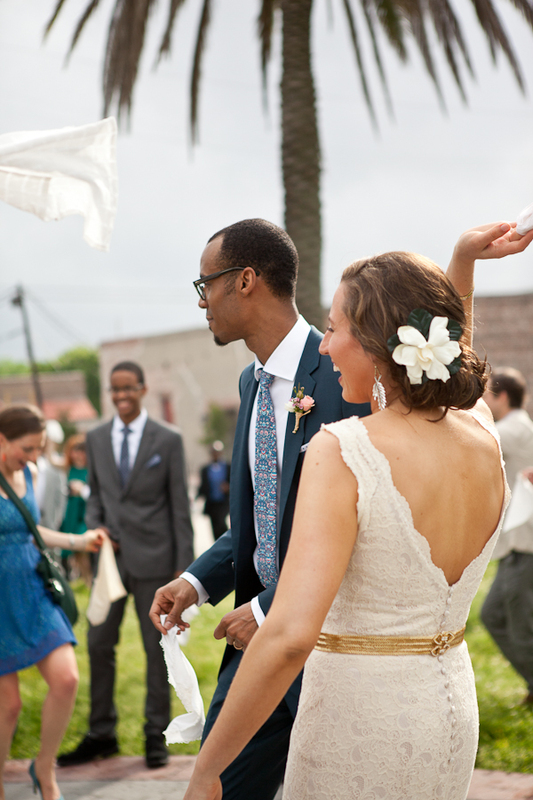 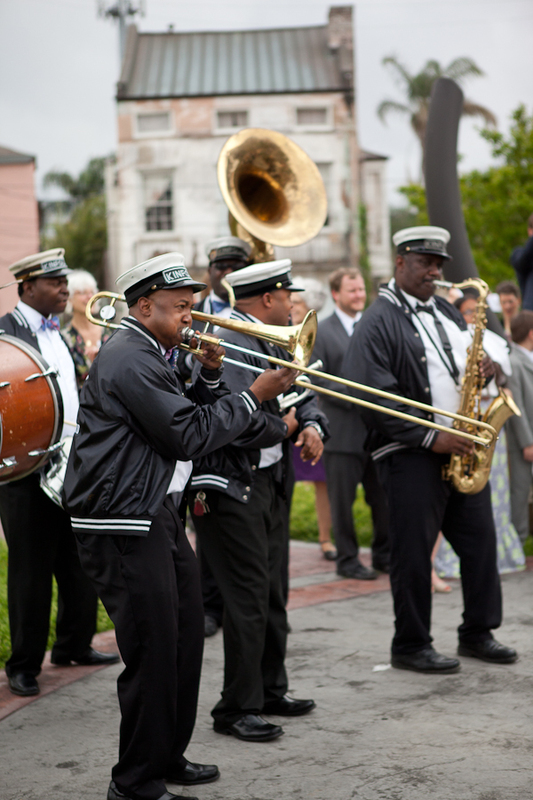 Each guest took a handkerchief at the beginning of the ceremony, and in true New Olreans fashion used those to wave and dance with as they joined the couple in a second line parade right after the ceremony – complete with a band leading the way! 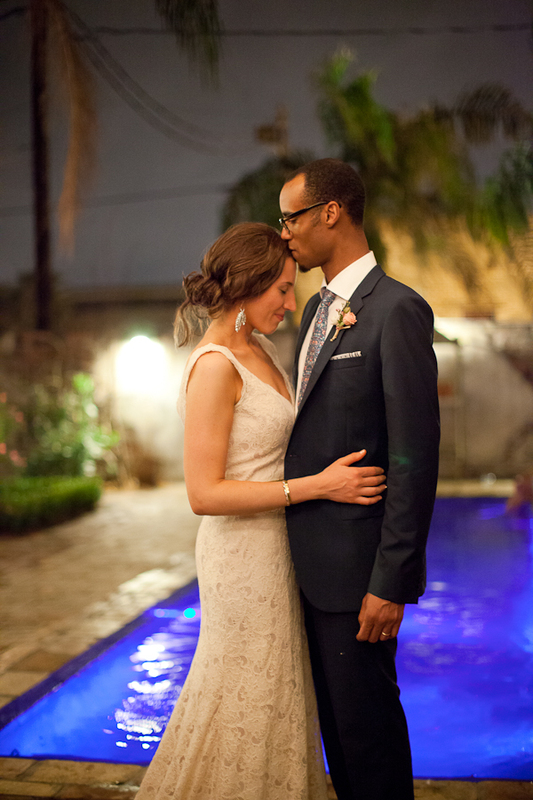 Emily wore a stunning lace dress with a gold belt and gold jewelry, while Steve looked fantastic in his navy blue suit (and really spectacular tie!). 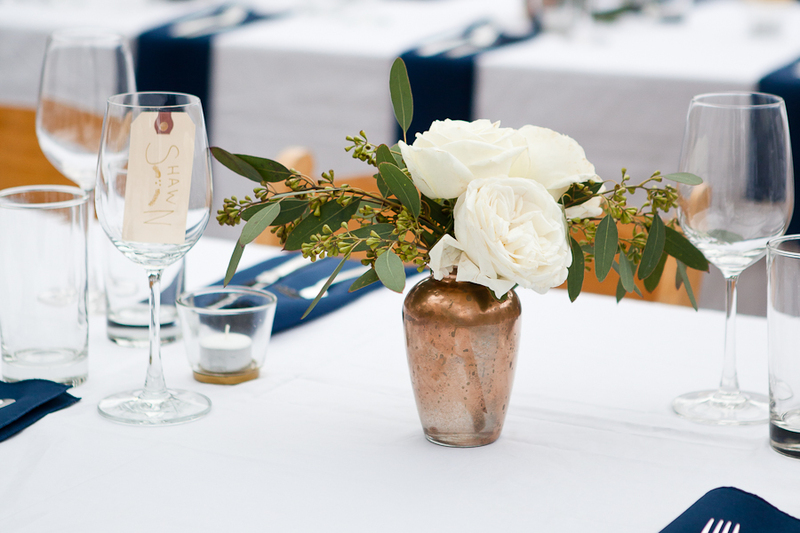 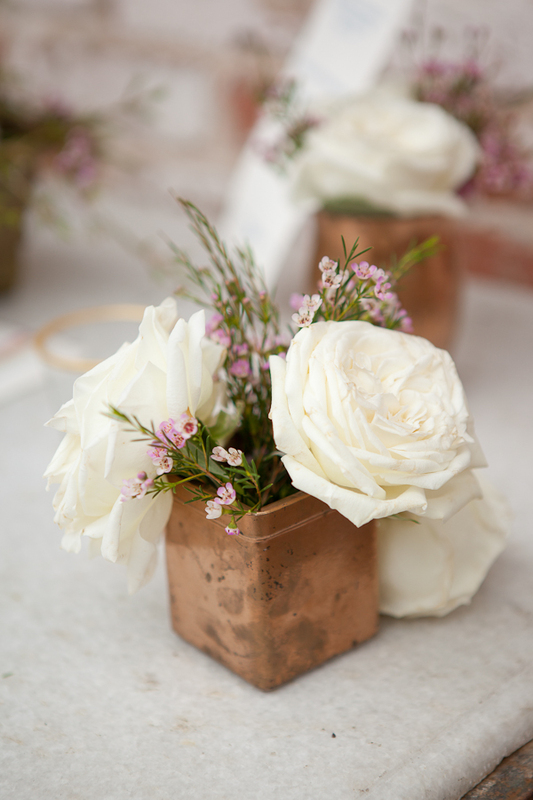 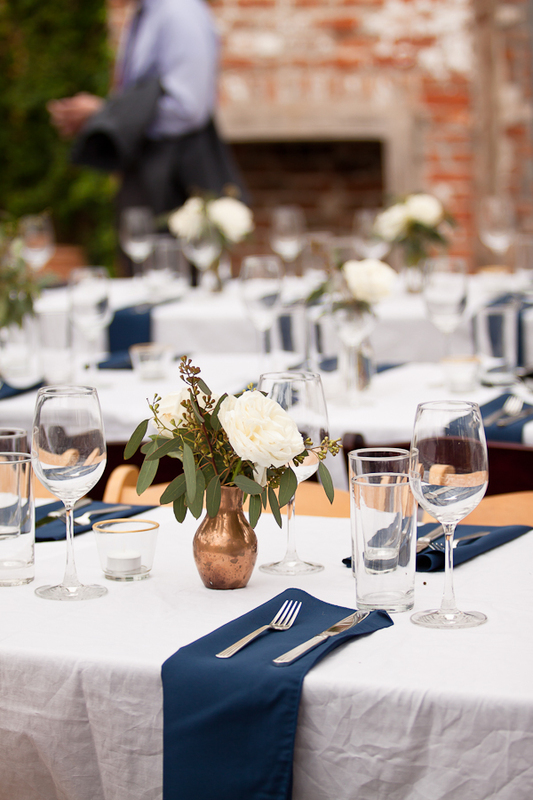 The white roses in copper colored vases looked very lovely against the blue and white table linens, and the papel picado banners were a great compliment to the string lights hung around the venue. 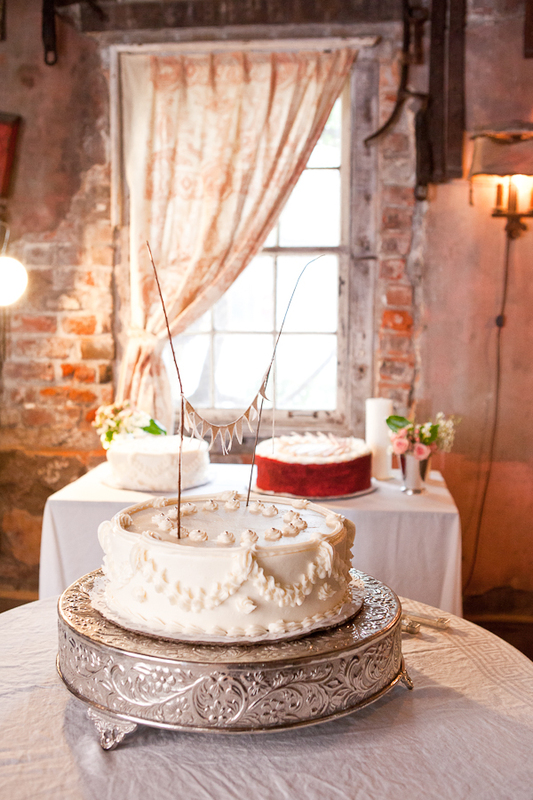 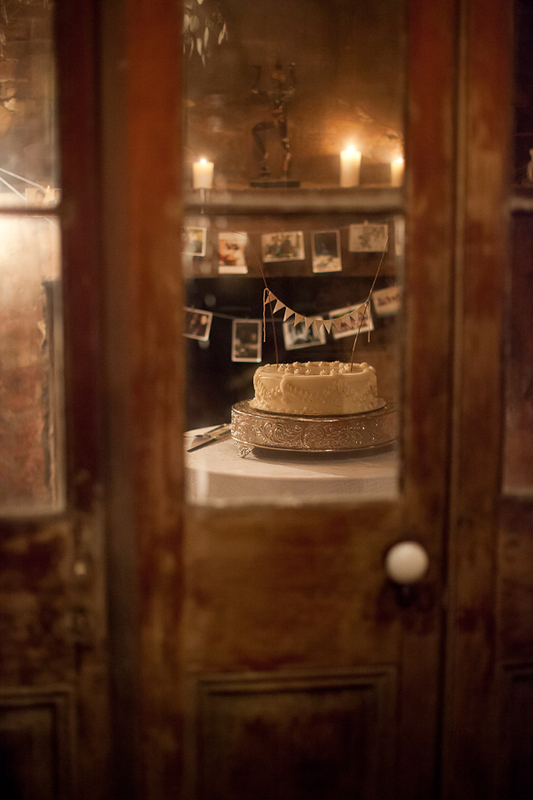 The cake room was just beautiful (as were all the rooms in this historic venue), with photos of the couple strung behind the three cakes, and the main cake set upon an intricate silver cake stand, and decorated with a cute flag banner. 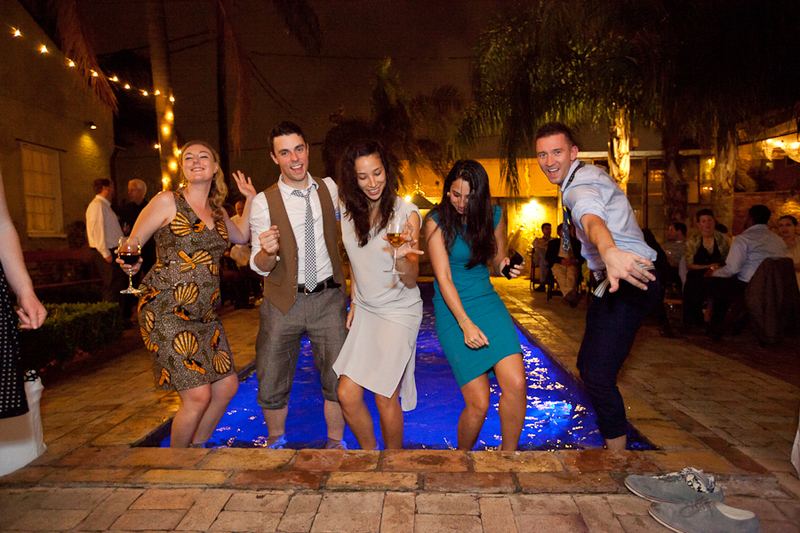 When the time came for the toasts, there was no short supply of laughter and tears, and when it came time to get dancing, there were lots of happy feet on the dance floor. 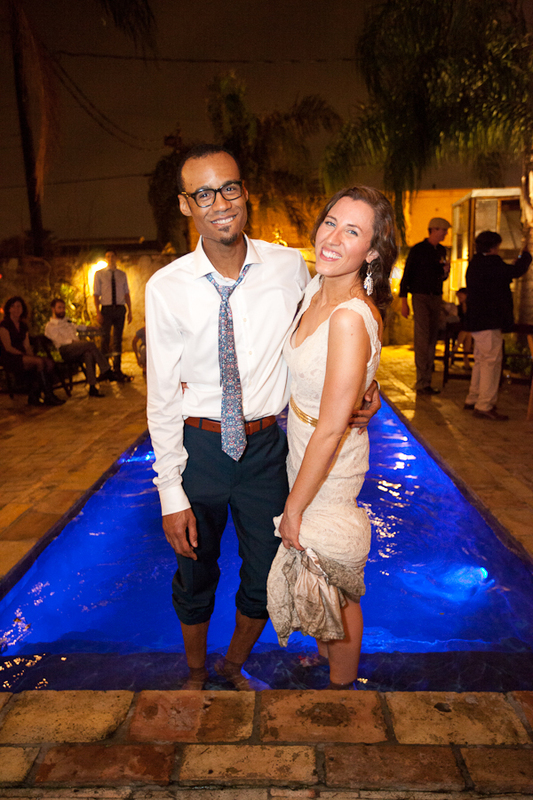 At the end of the night we were able to sneak a couple of photos in front of the vibrant blue water of the pool, right as guests began to wade into the waters. 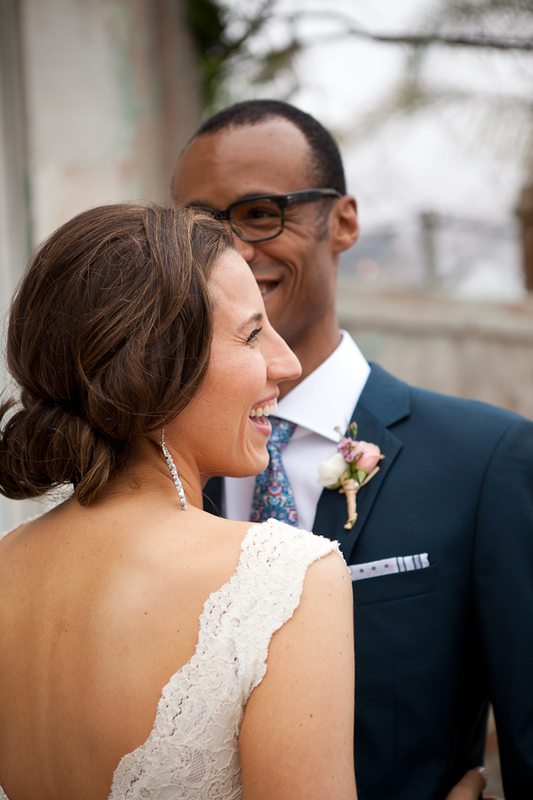 I think the pictures tell the story a bit better than I can, I am so very lucky to have gotten the chance to photograph this wedding, I know these two have many many happy years ahead of them.